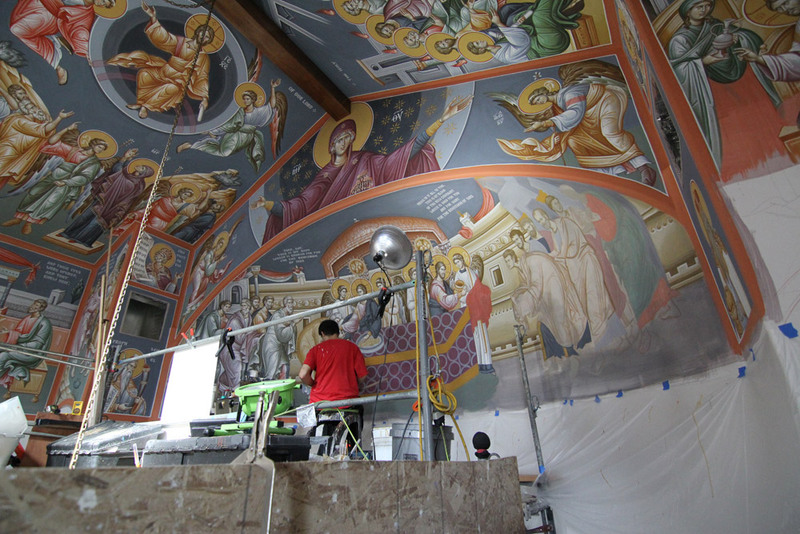 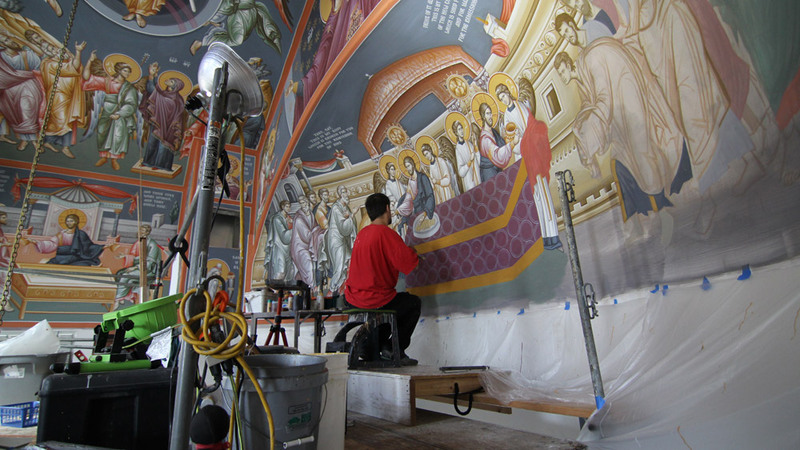 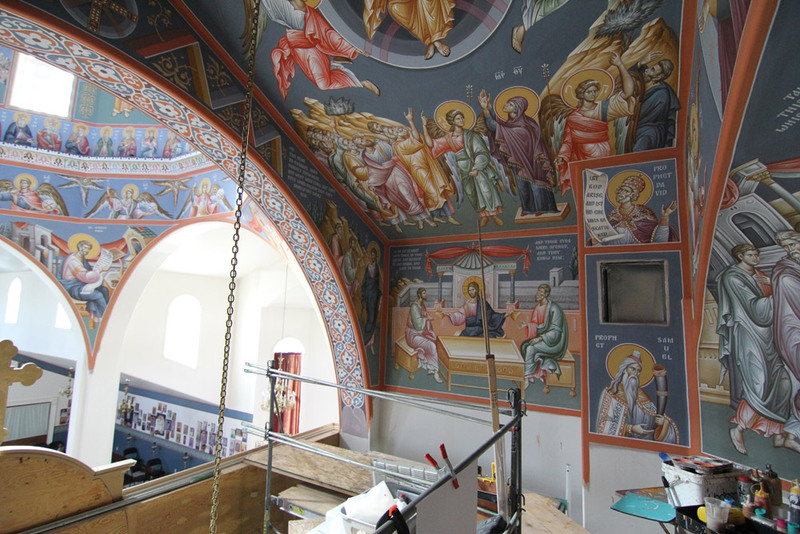 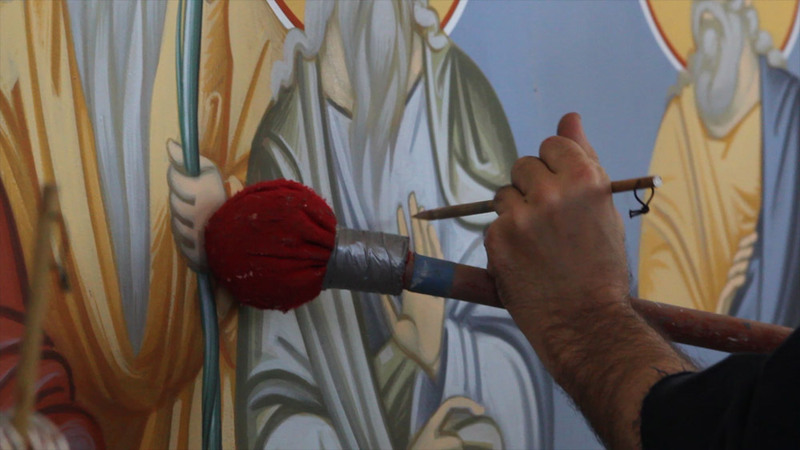 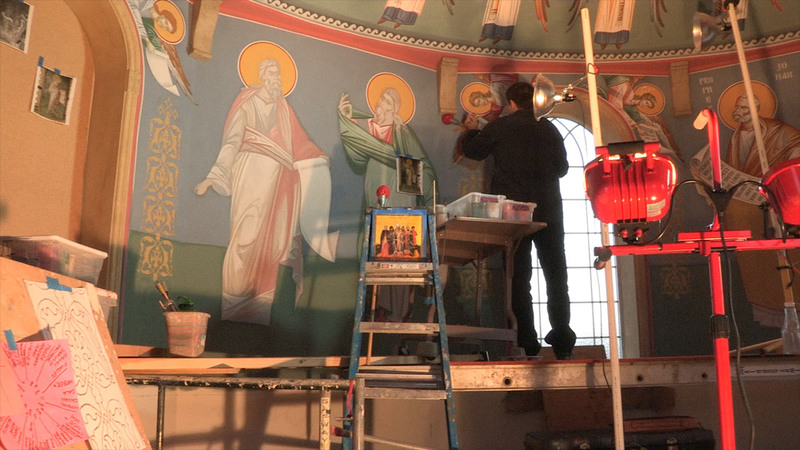 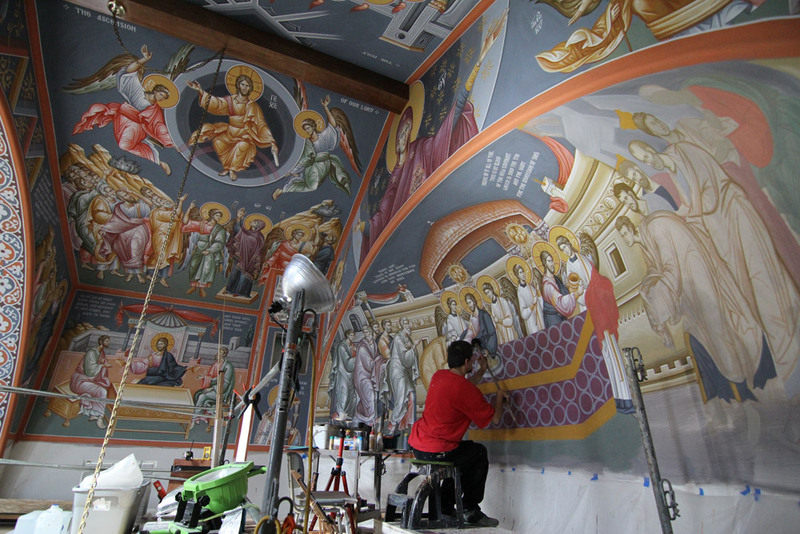 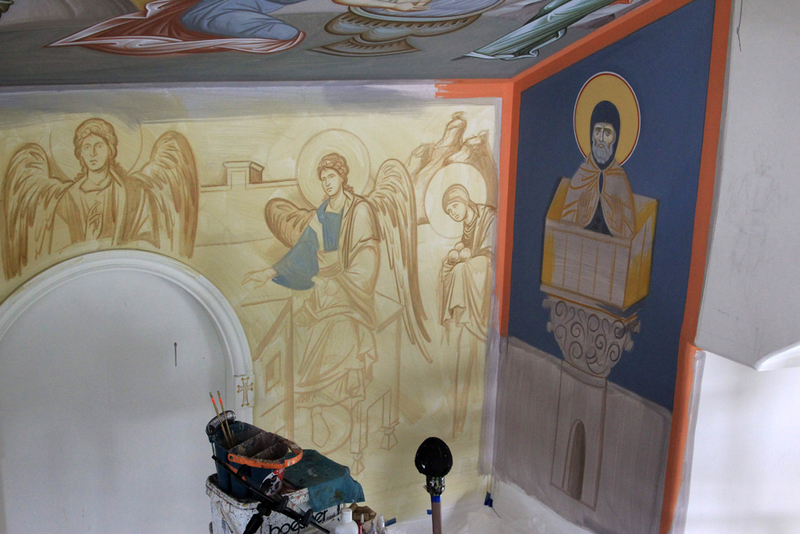 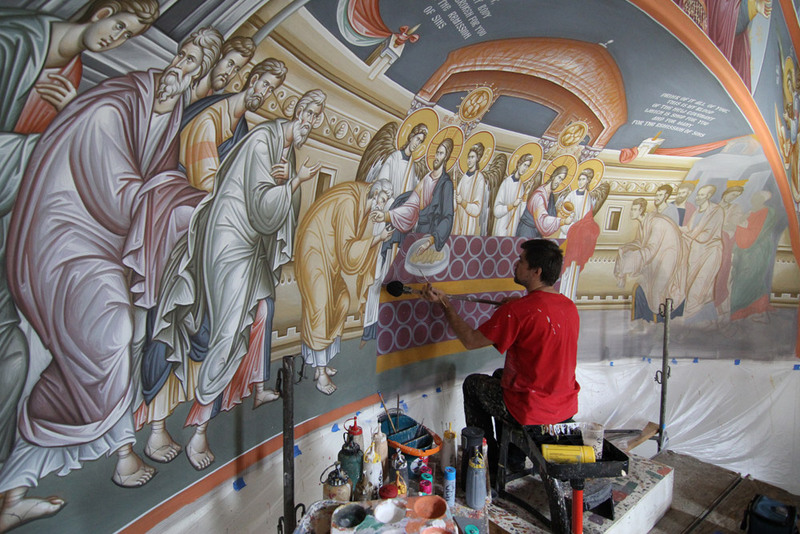 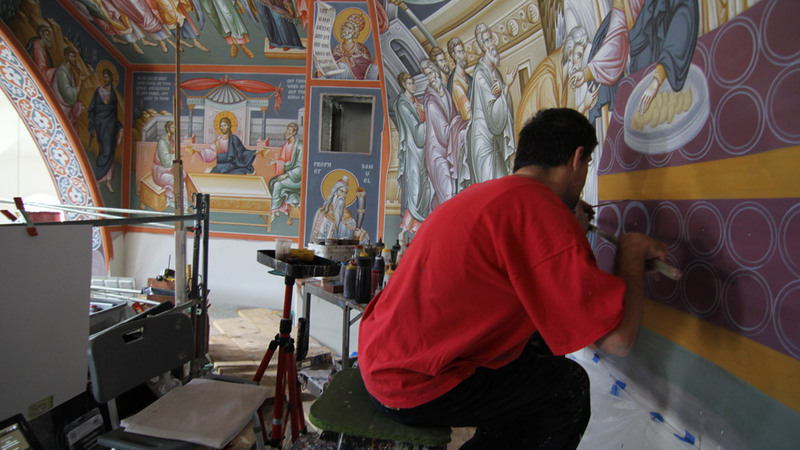 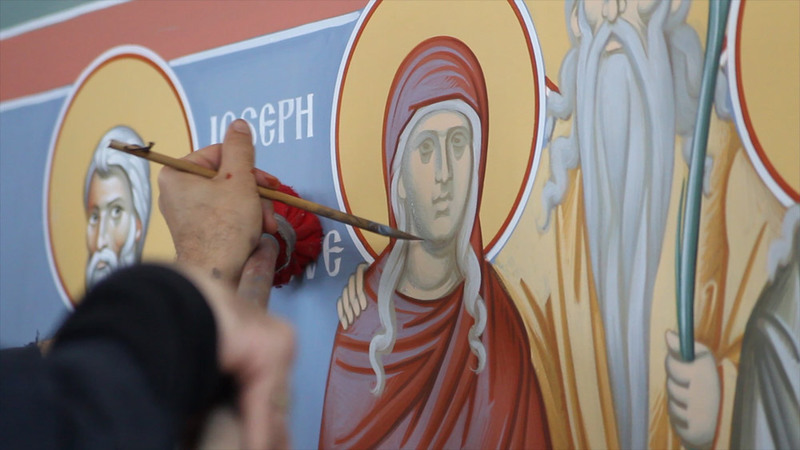 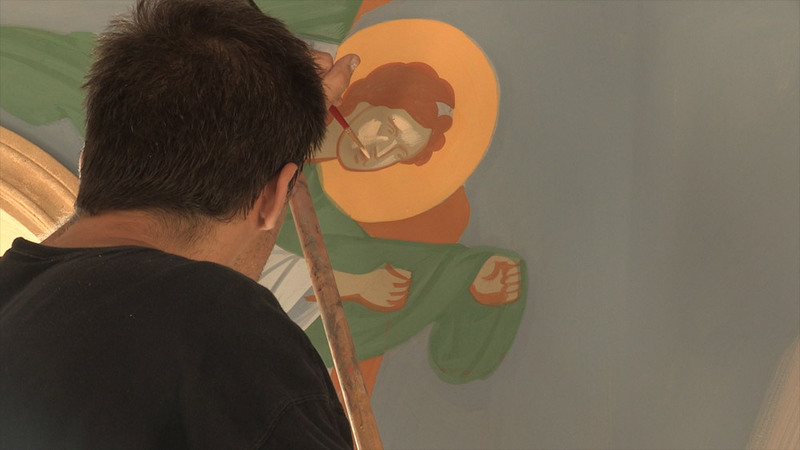 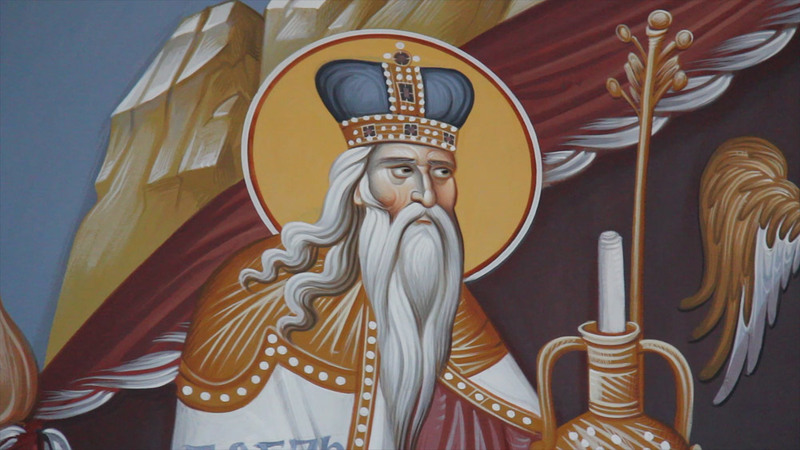 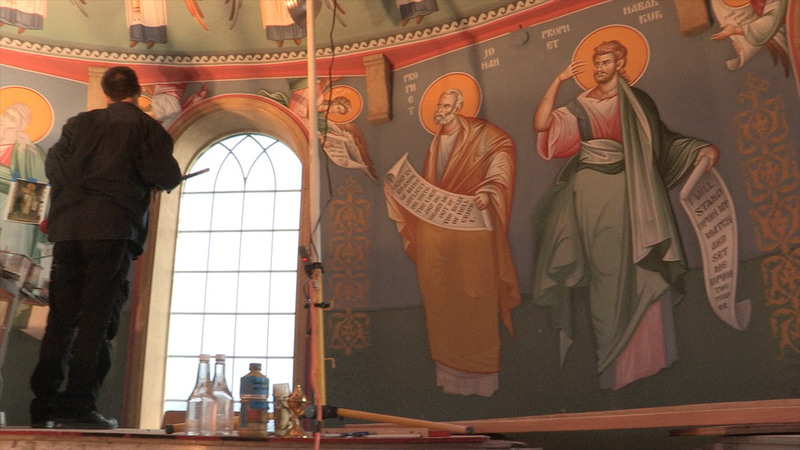 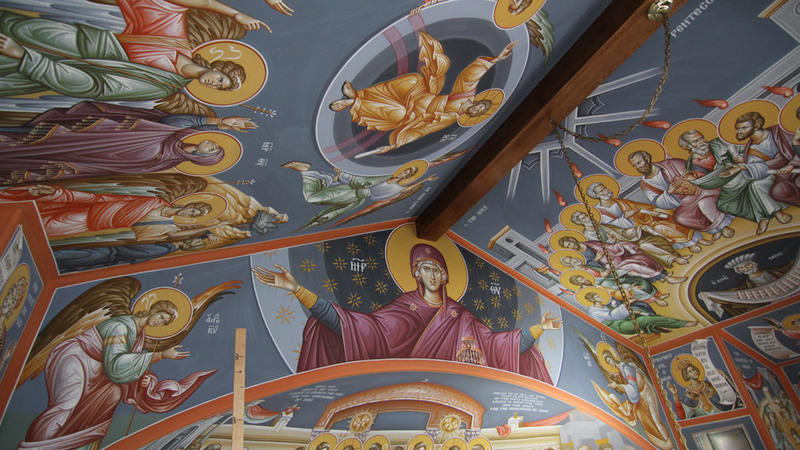 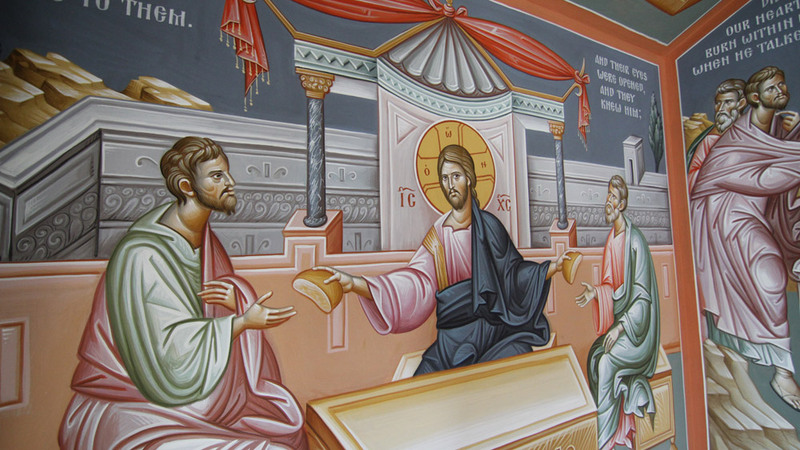 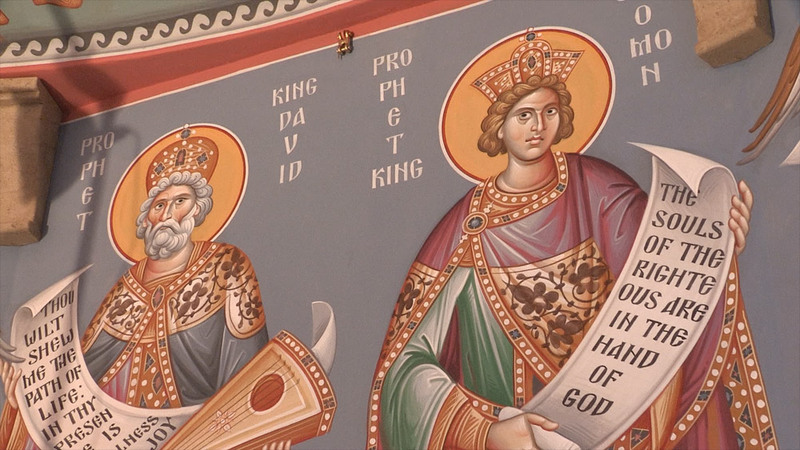 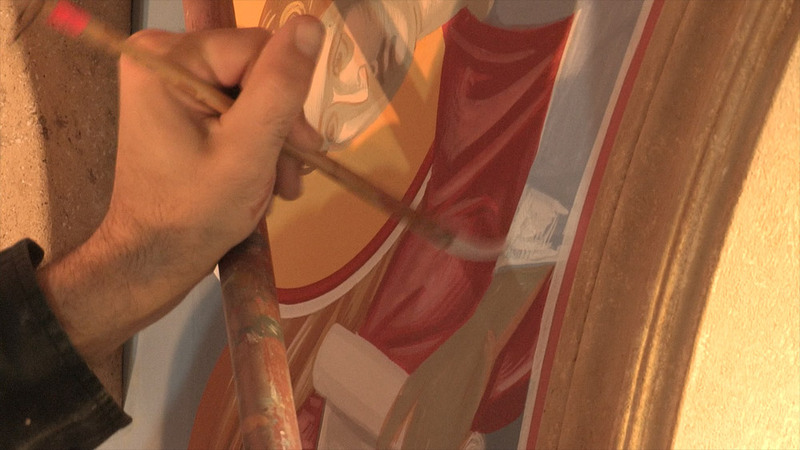 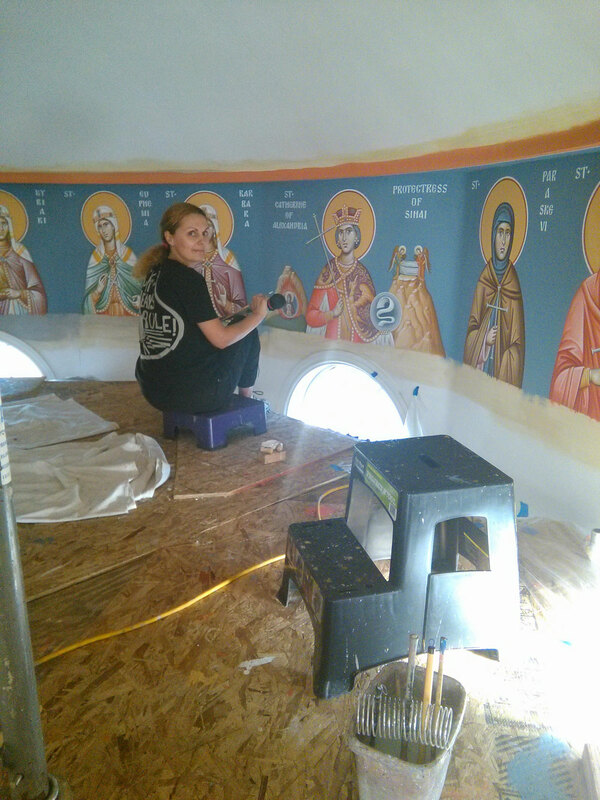 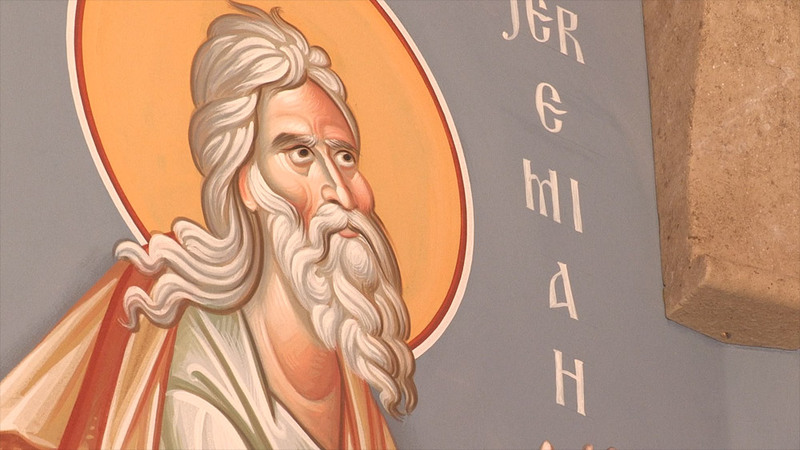 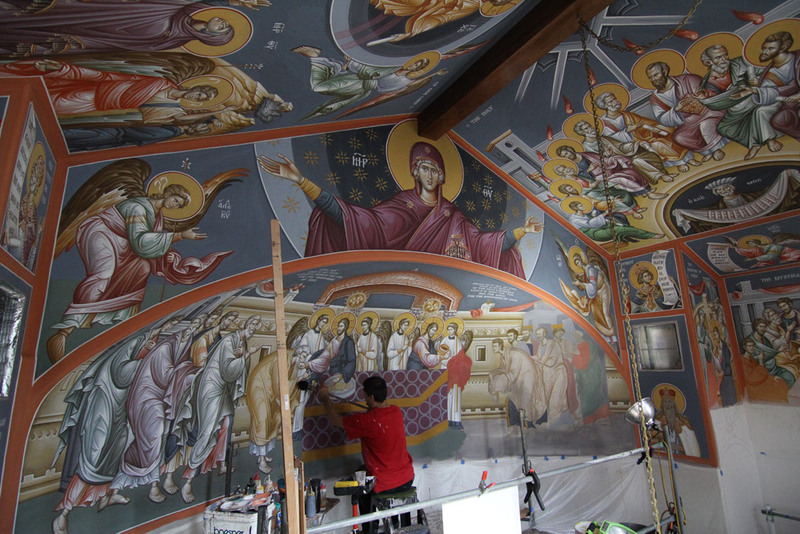 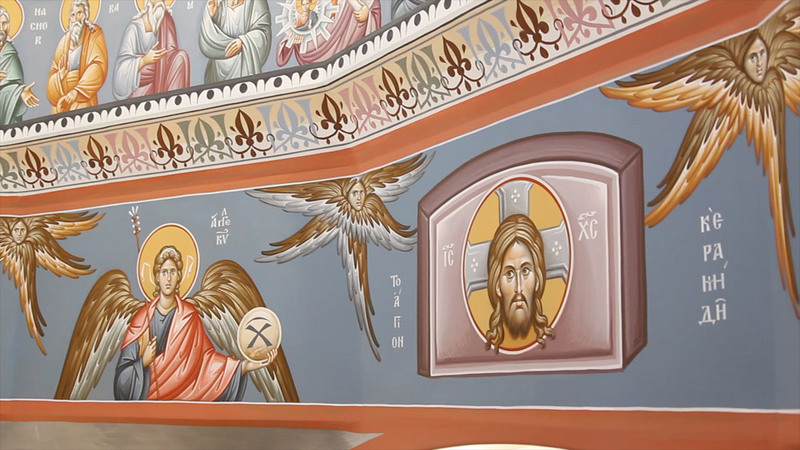 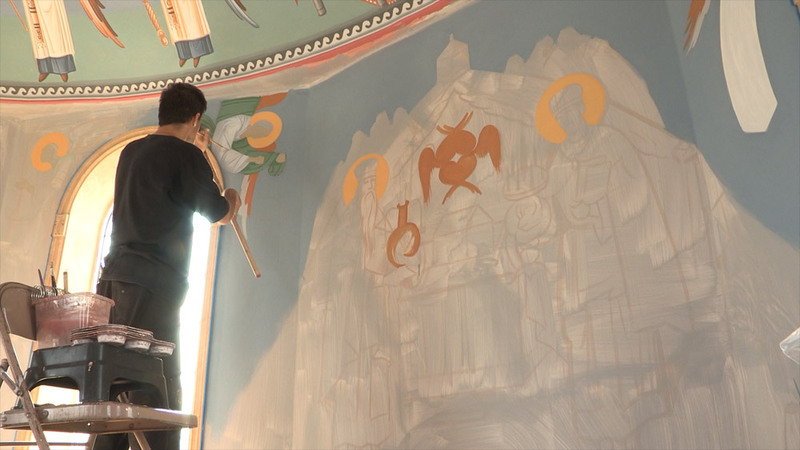 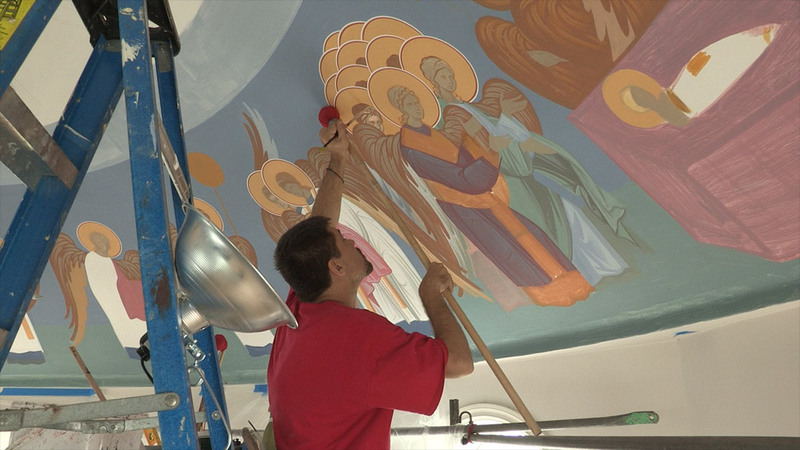 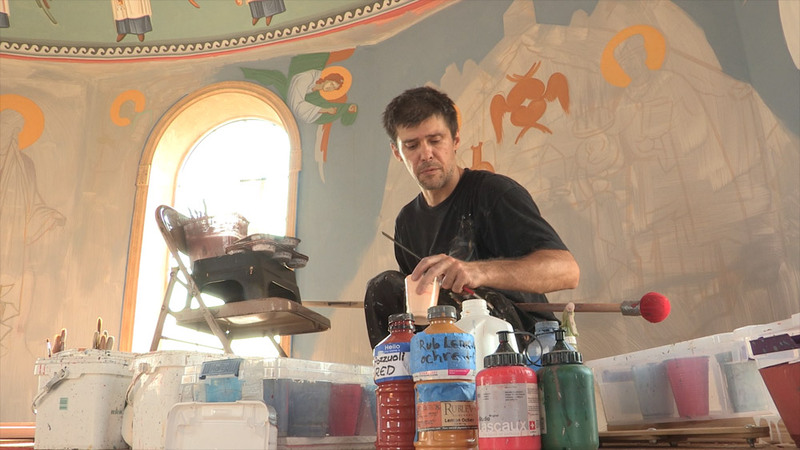 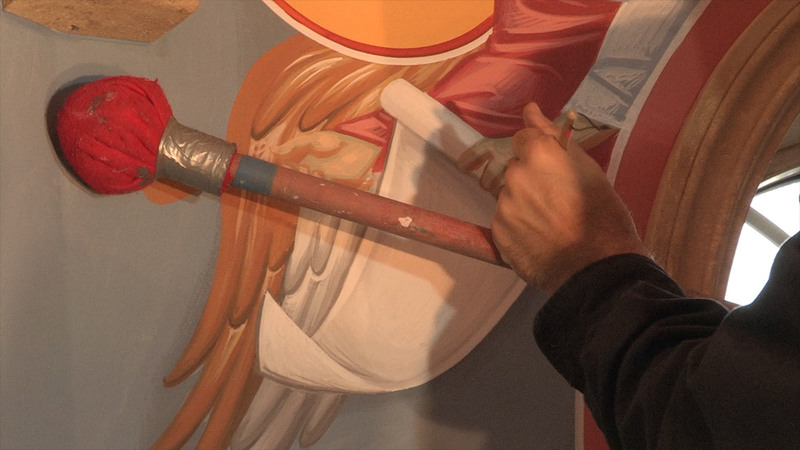 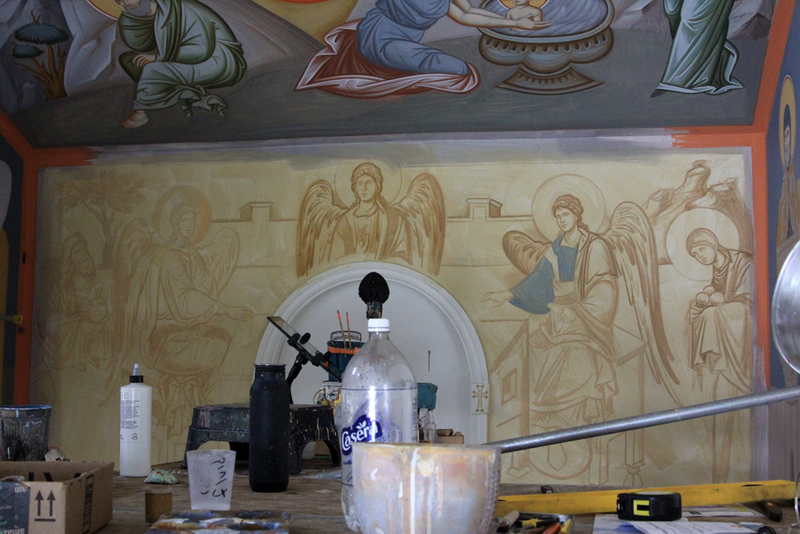 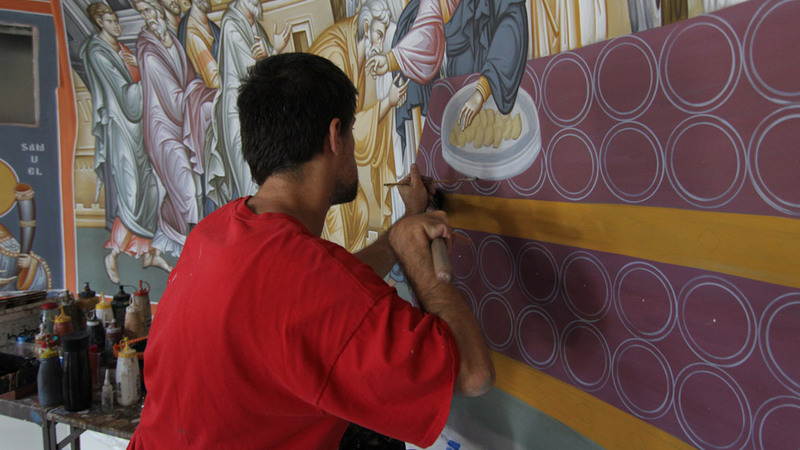 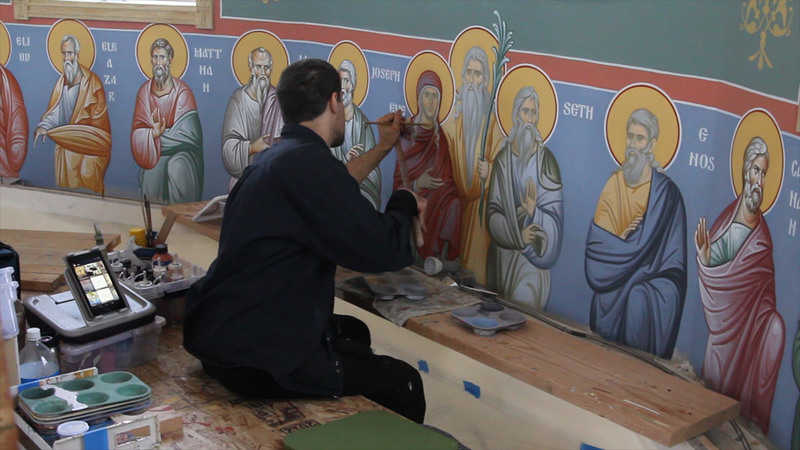 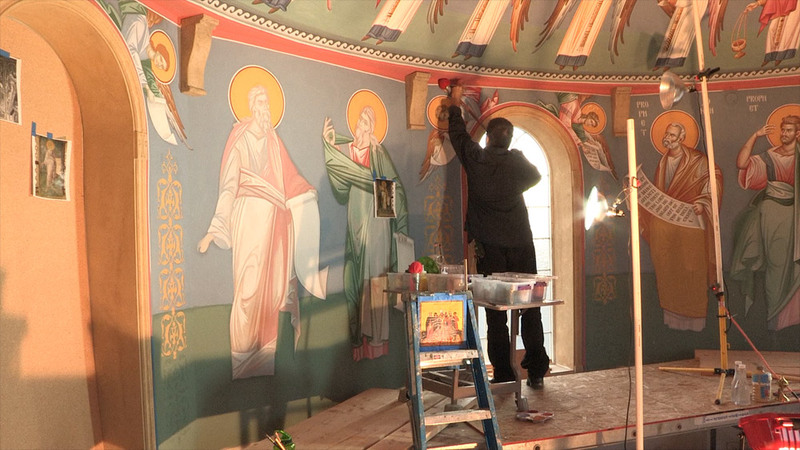 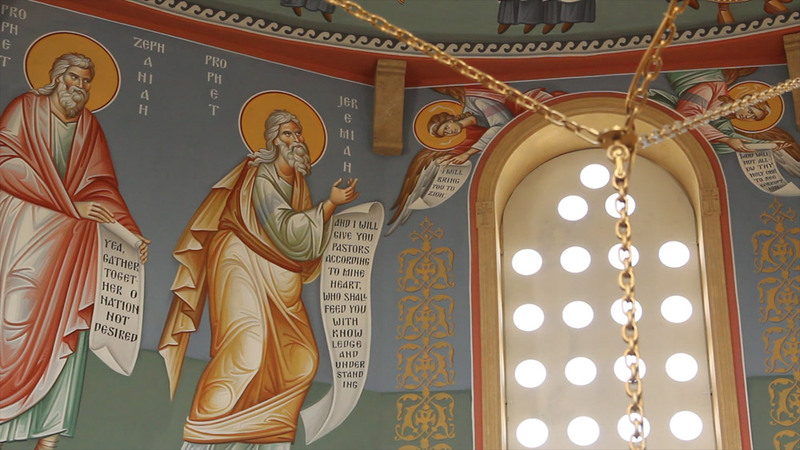 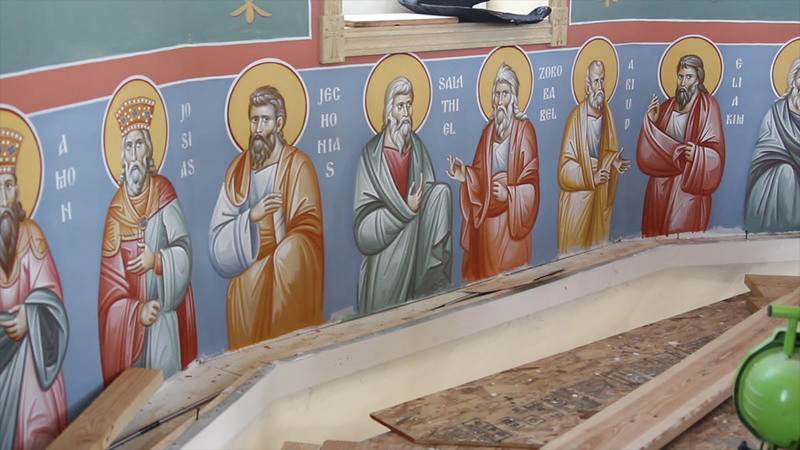 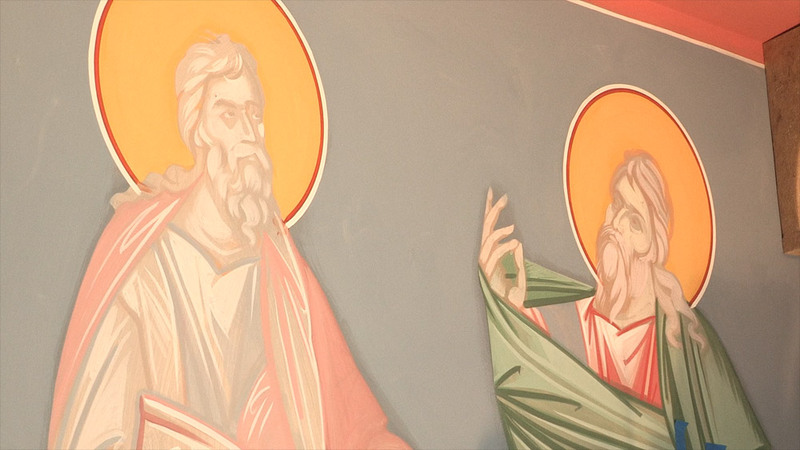 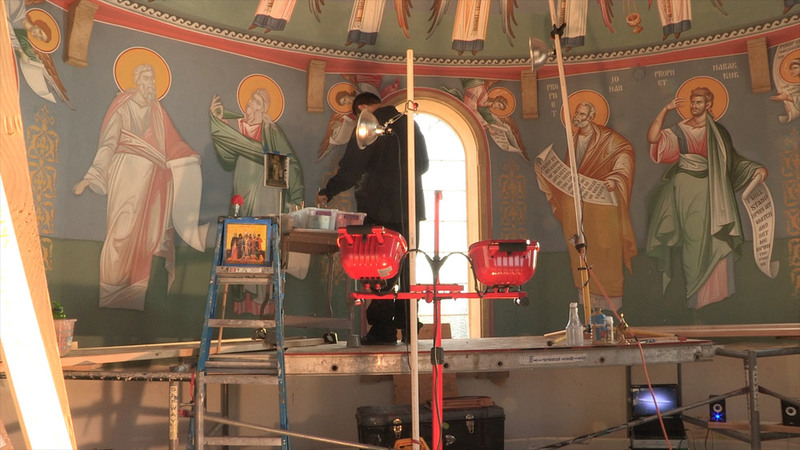 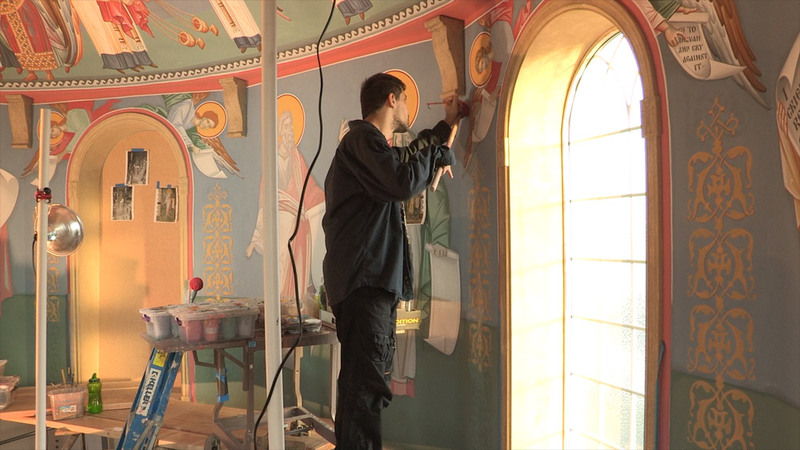 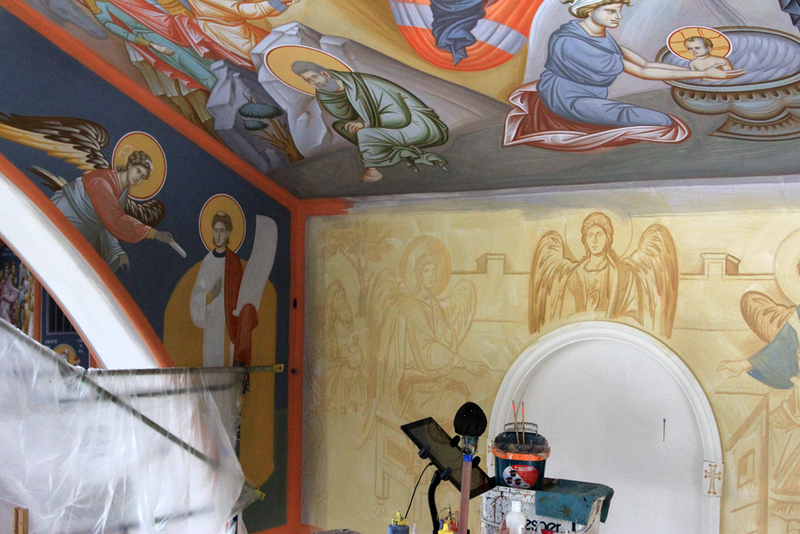 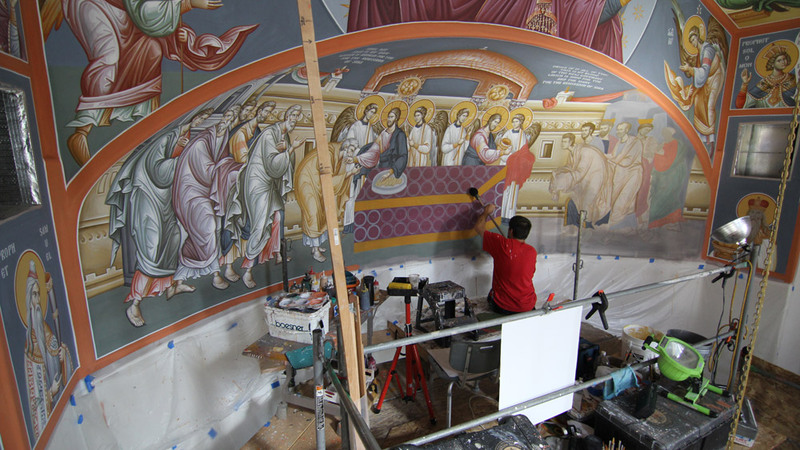 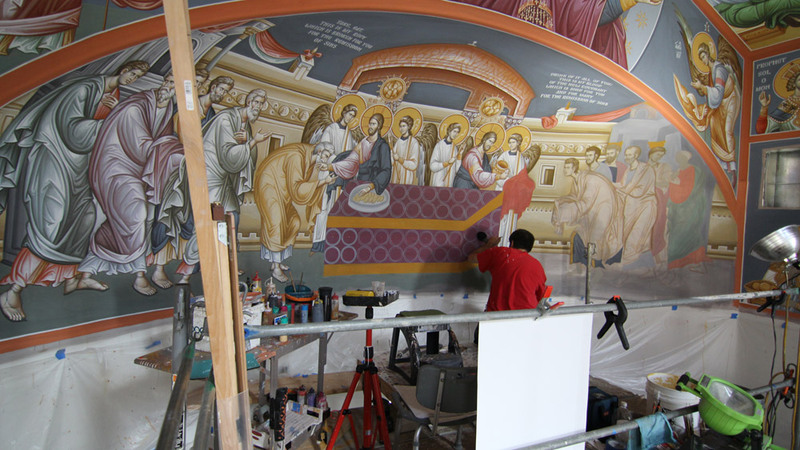 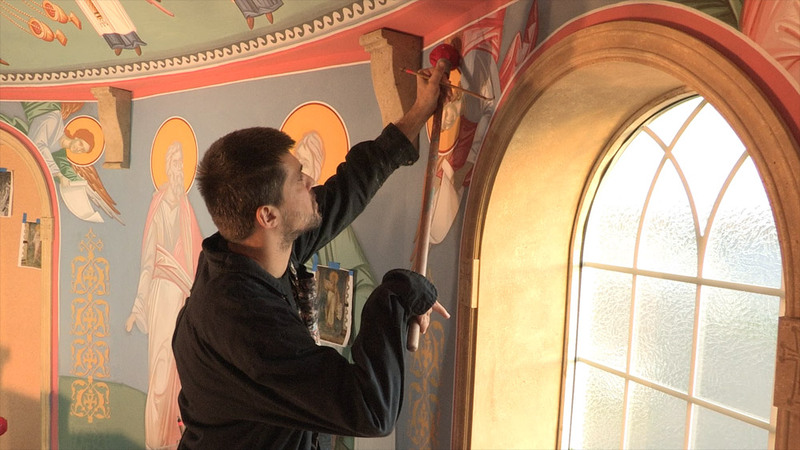 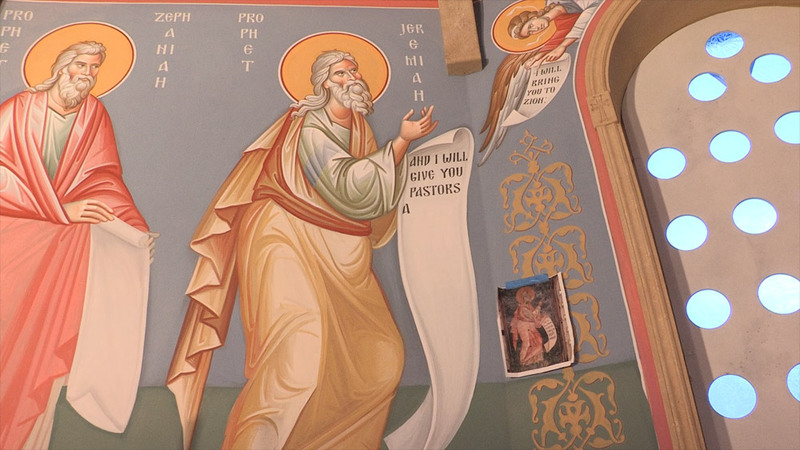 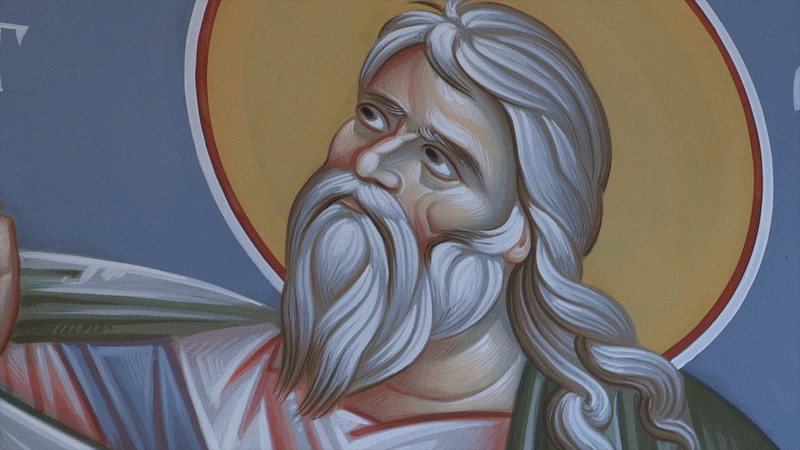 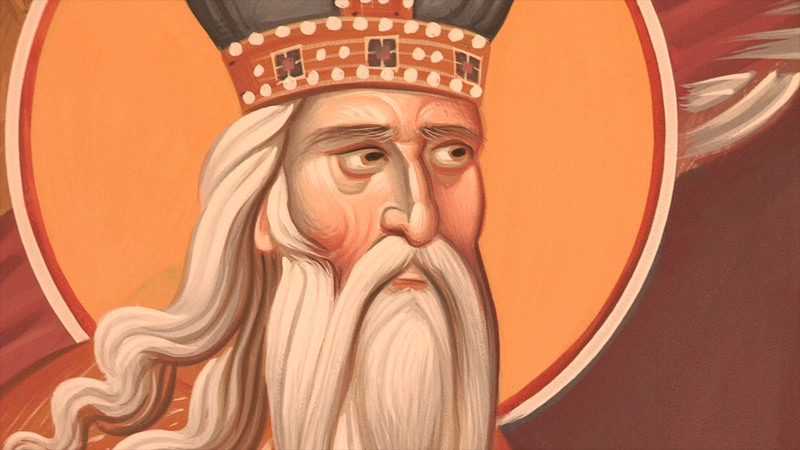 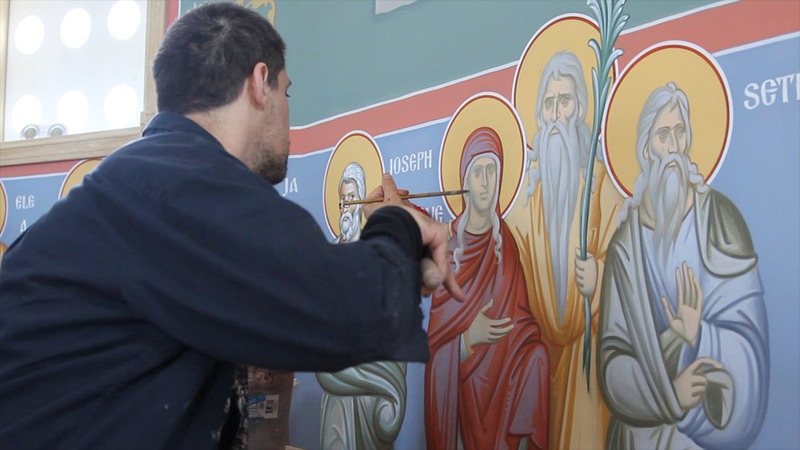 Five years ago our parish began communicating with an iconographer and his wife in Belgrade, Serbia, Ugljesa and Zvezdana Mileta. 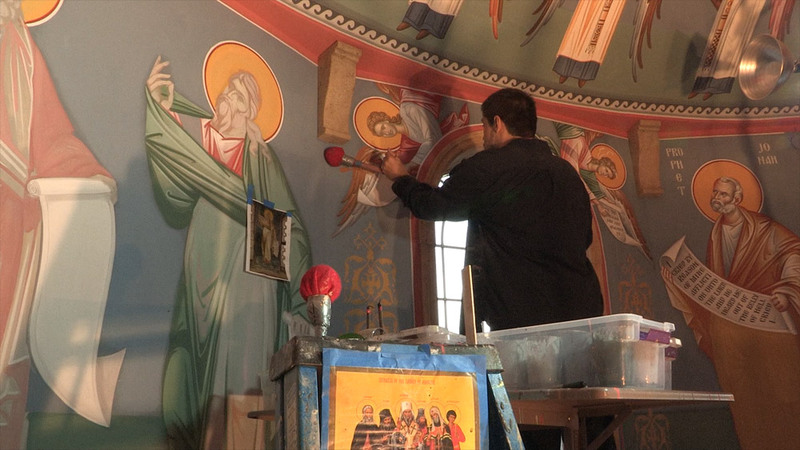 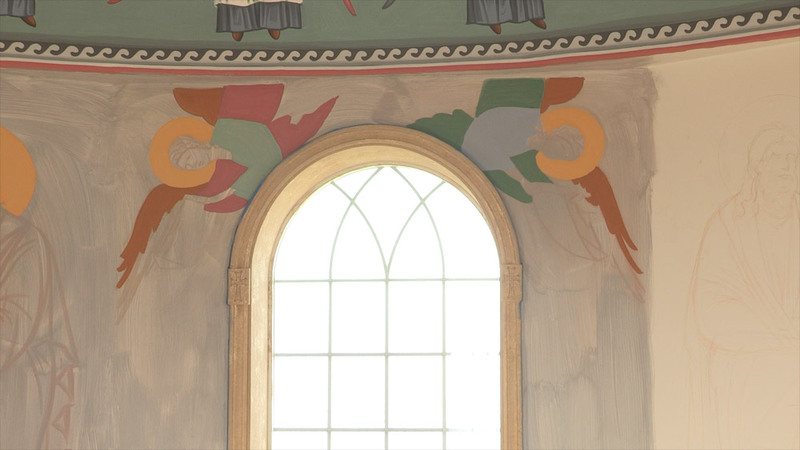 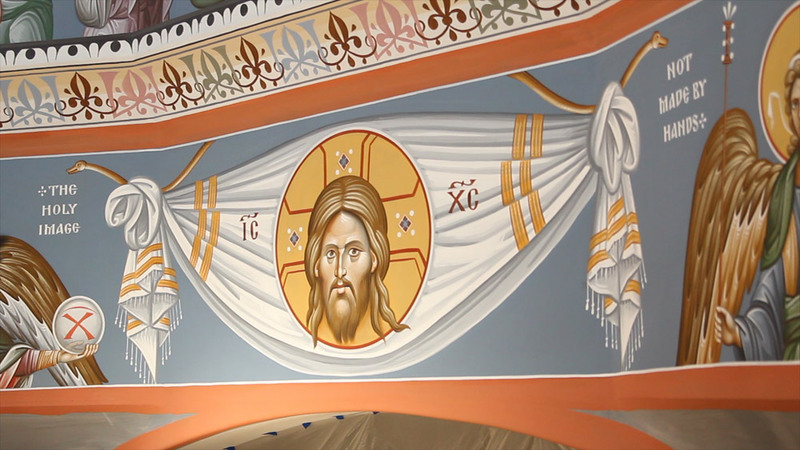 I had seen their iconography in pictures brought back by one of our parishioners from a beautiful Serbian church in Butte, Montana. 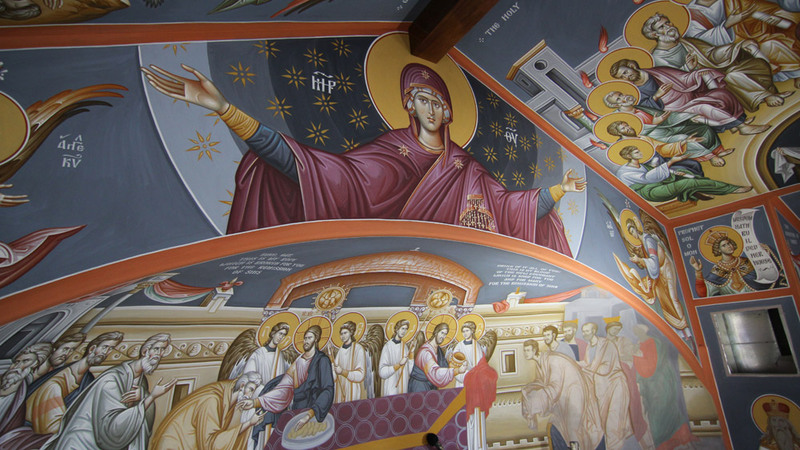 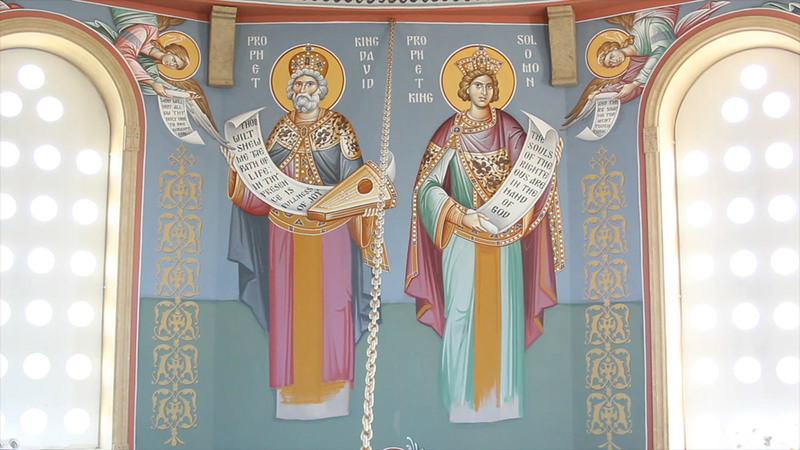 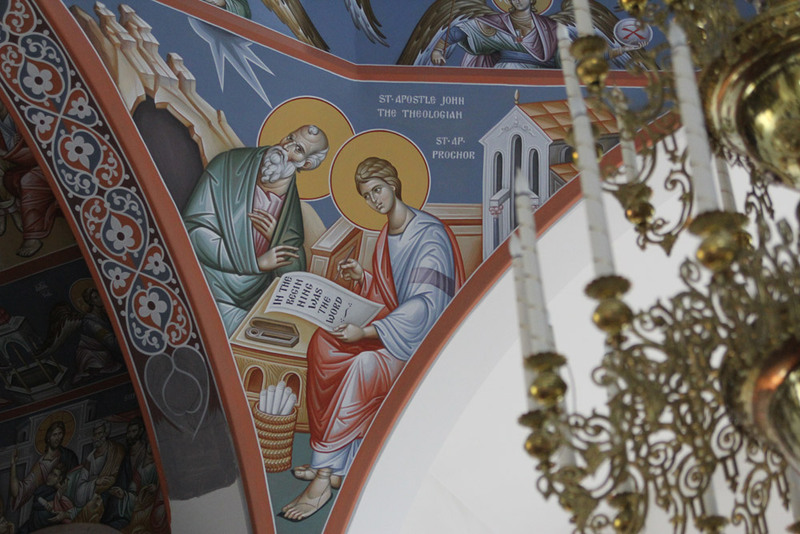 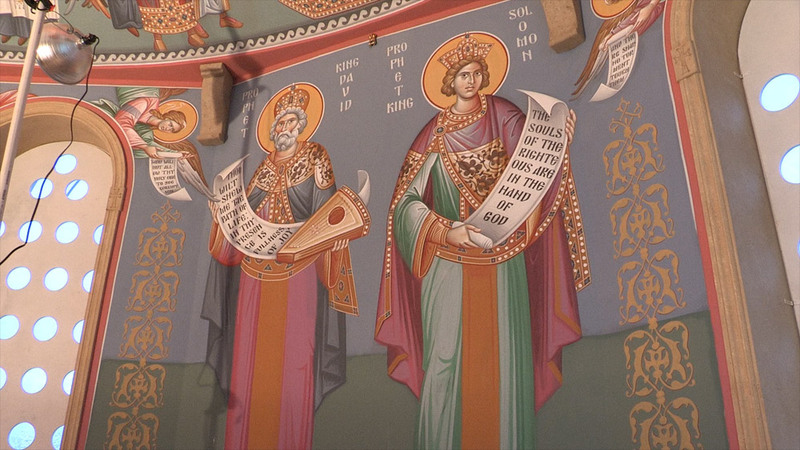 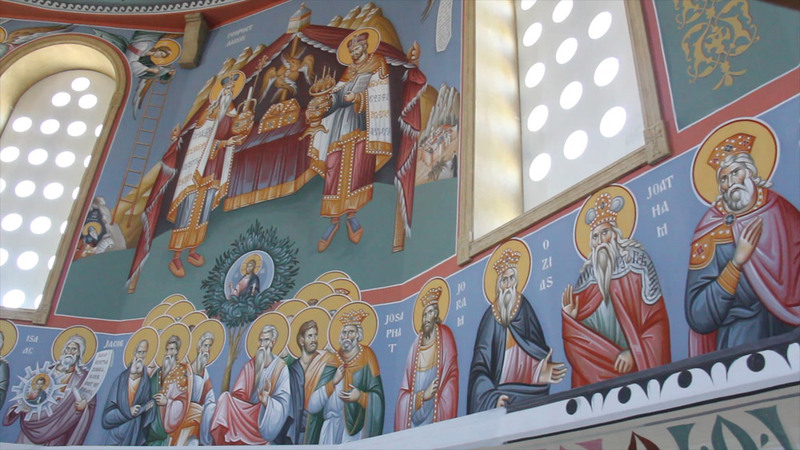 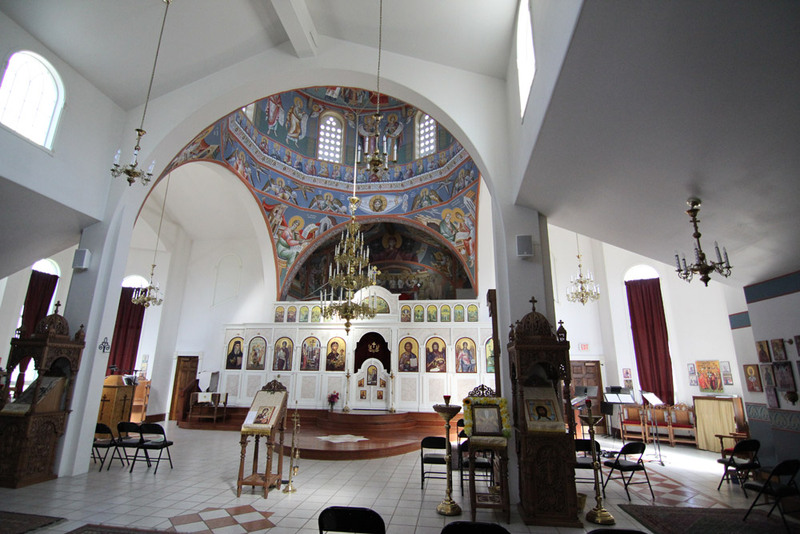 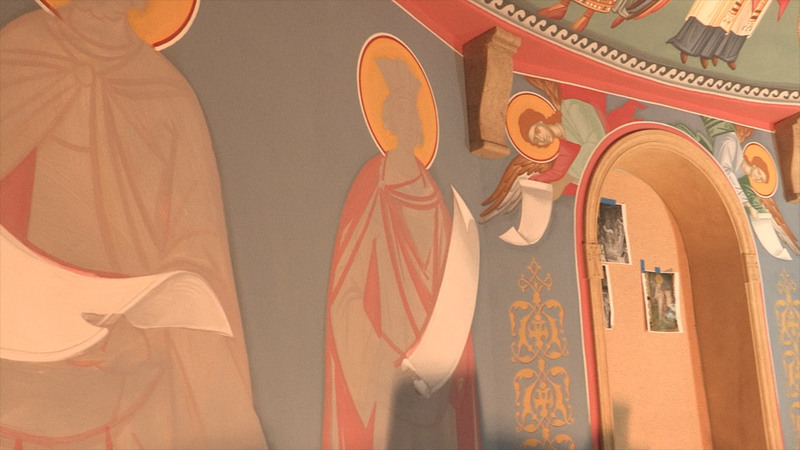 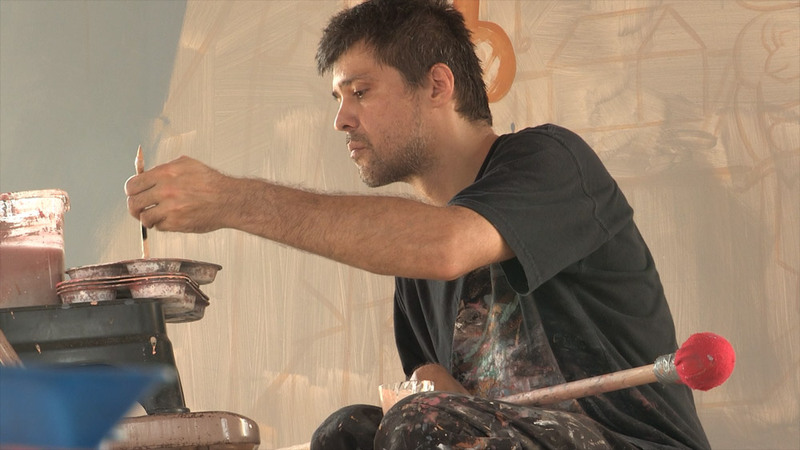 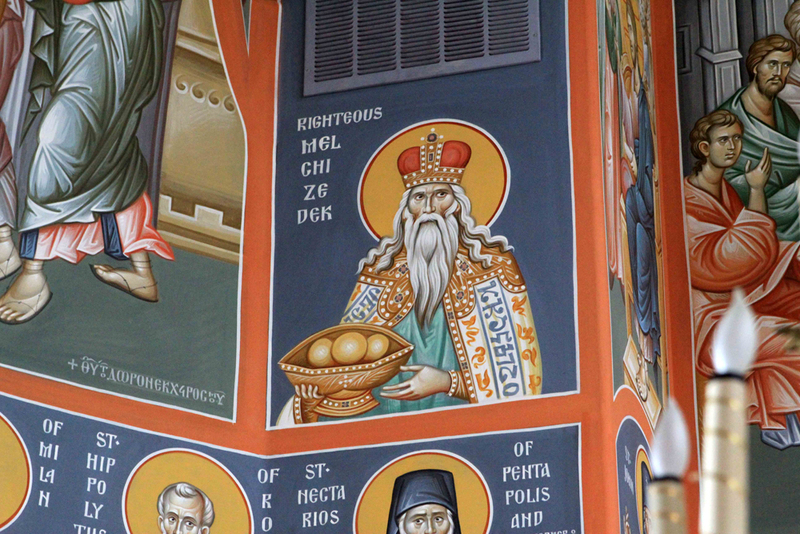 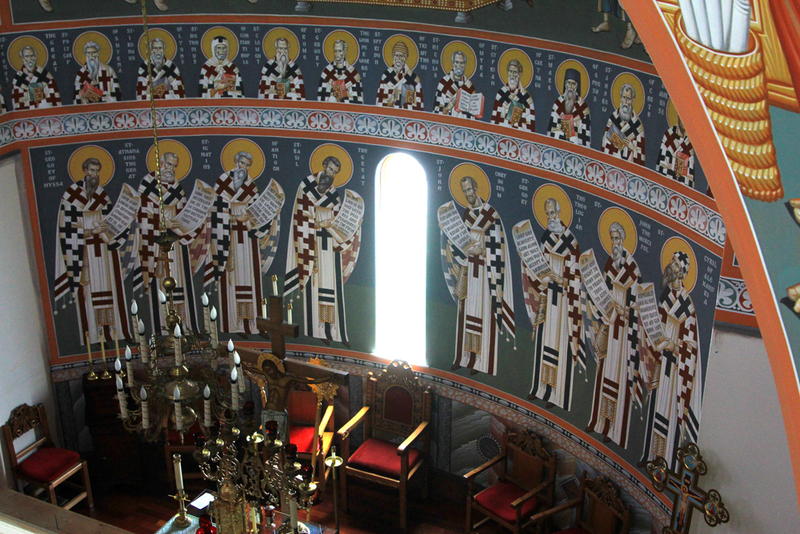 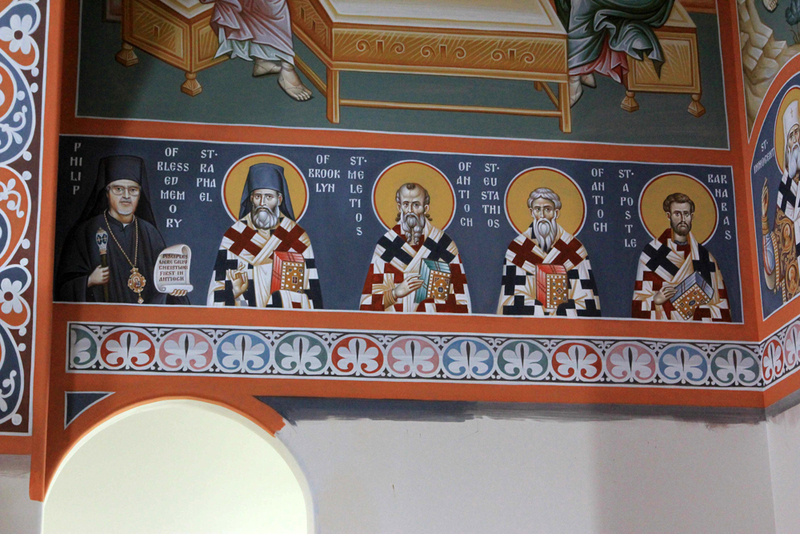 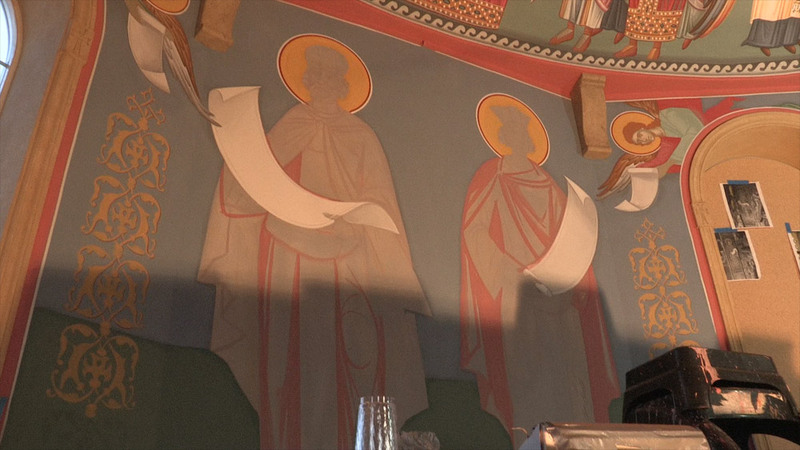 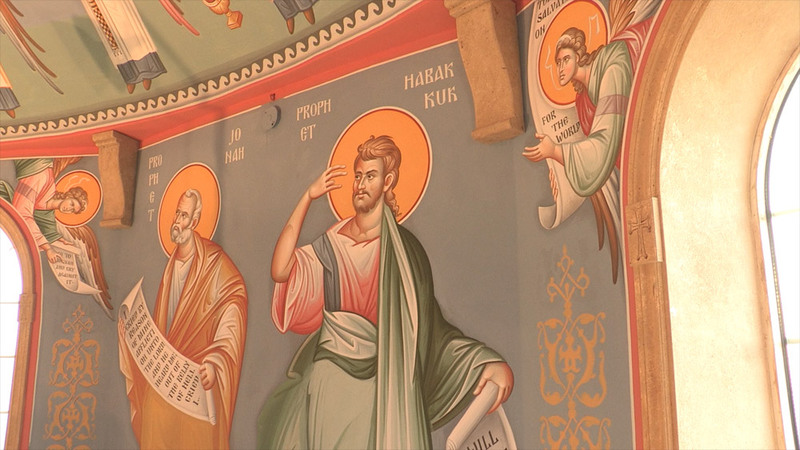 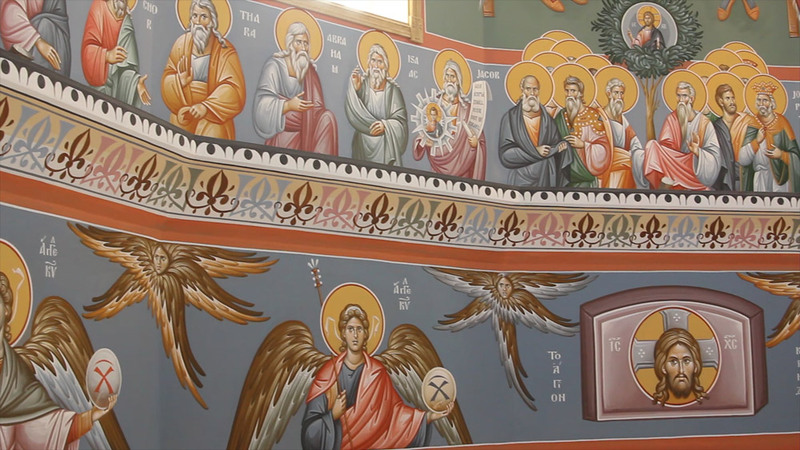 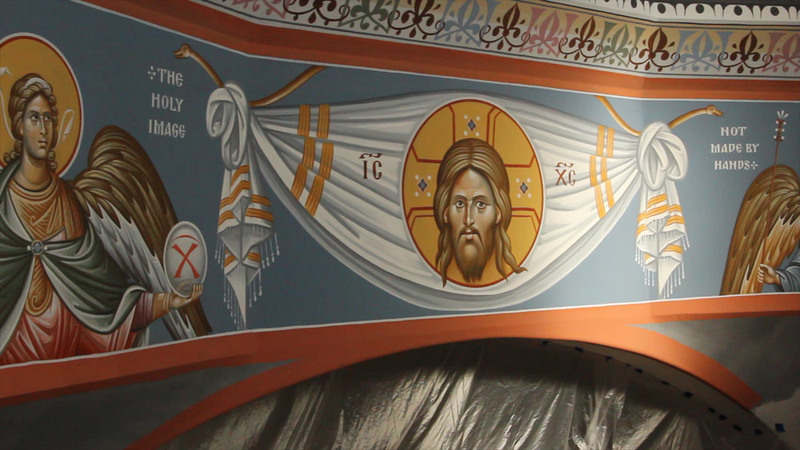 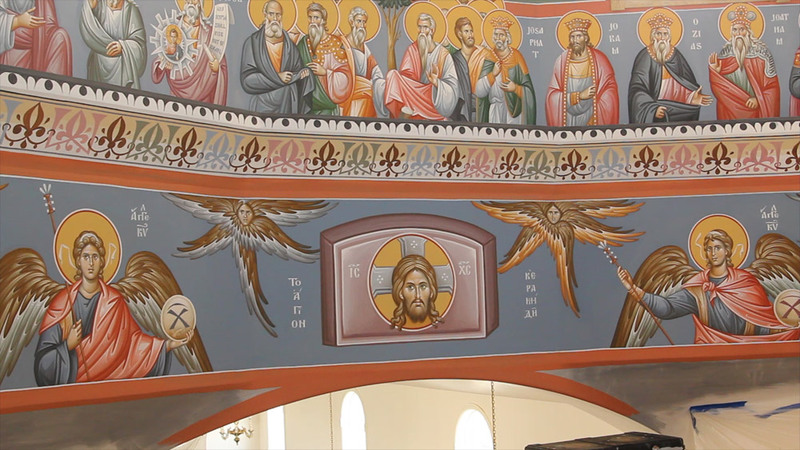 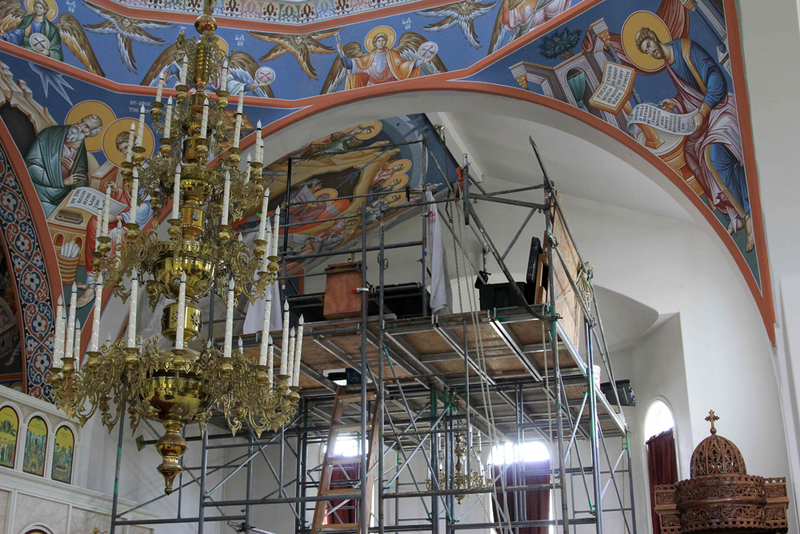 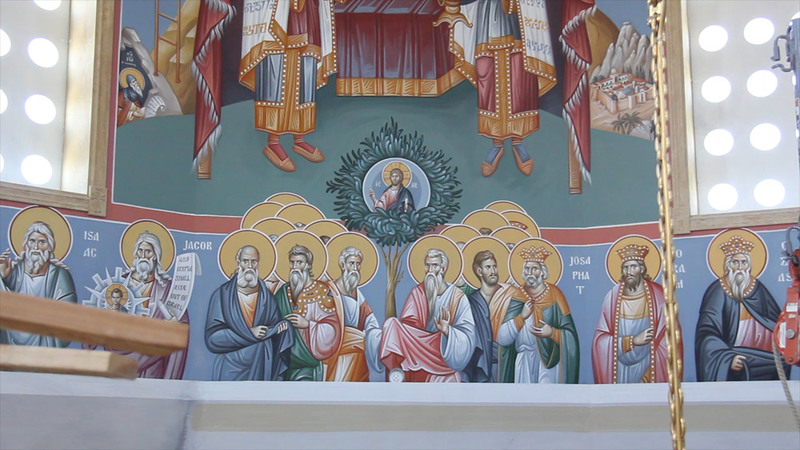 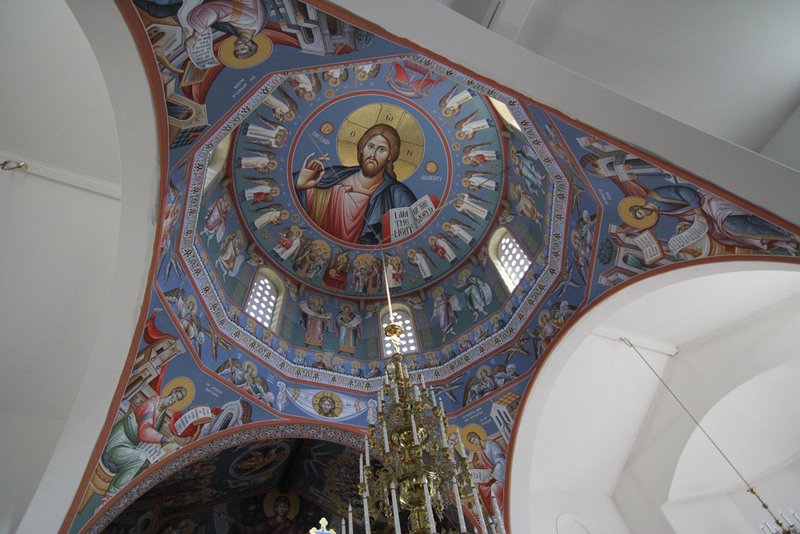 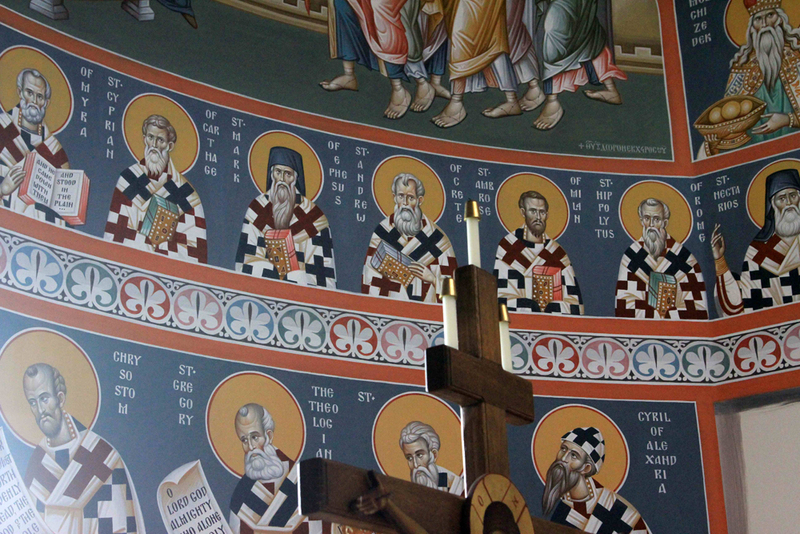 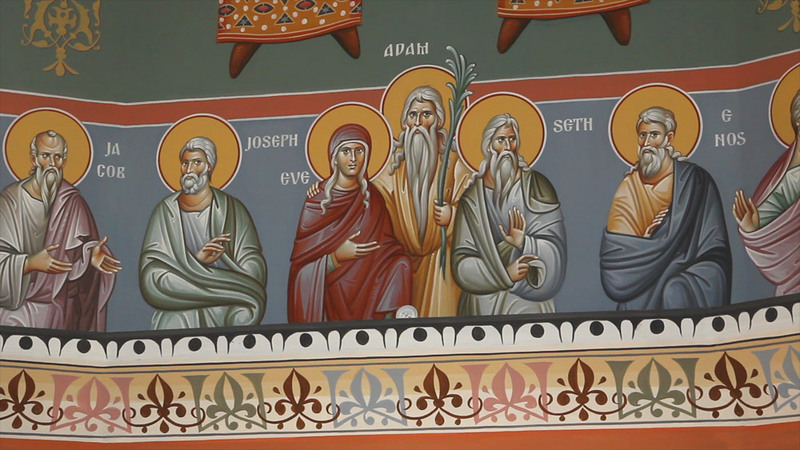 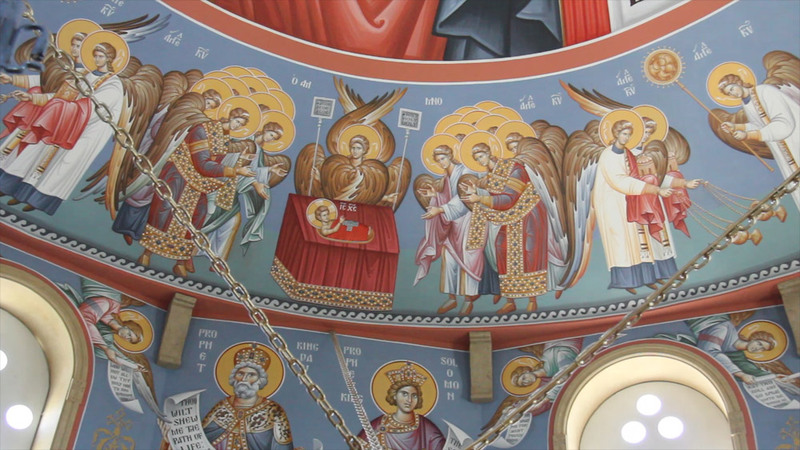 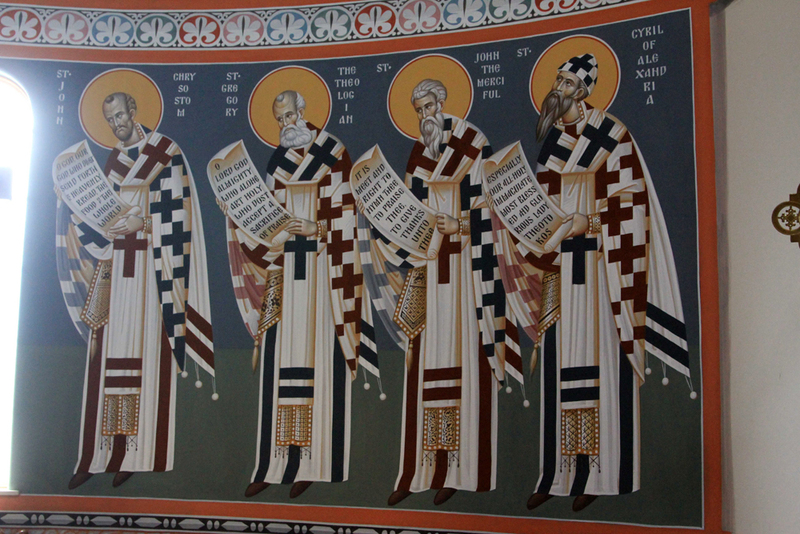 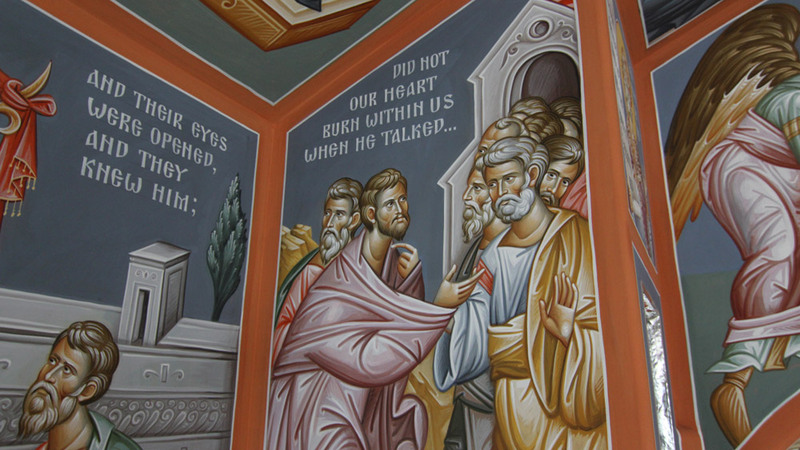 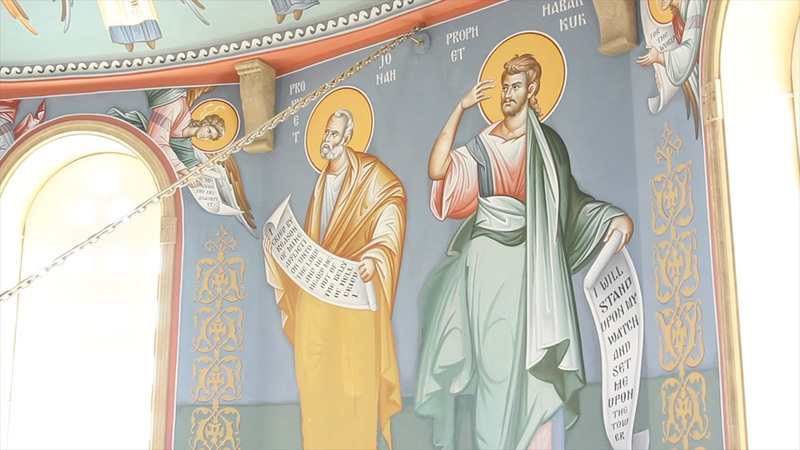 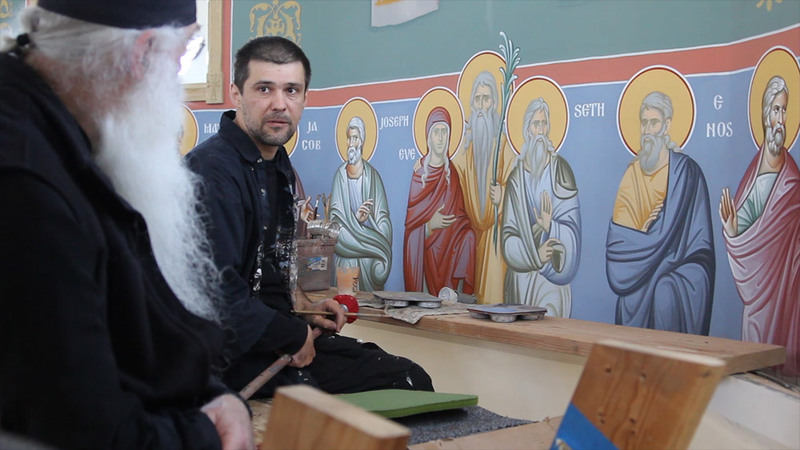 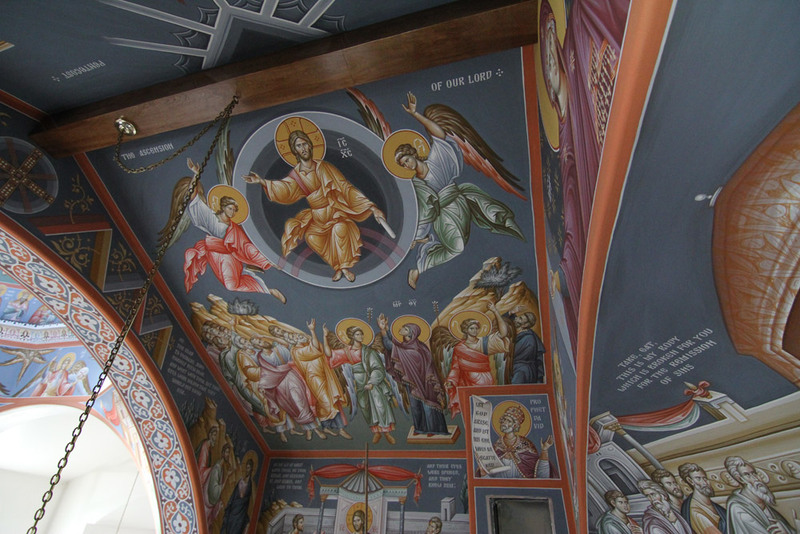 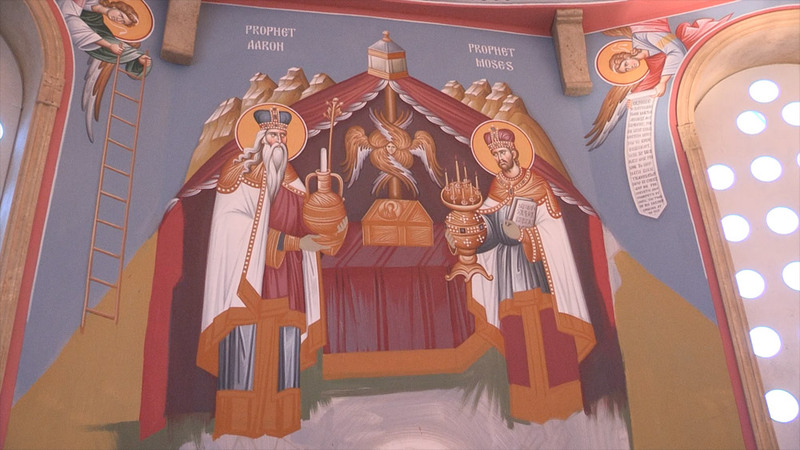 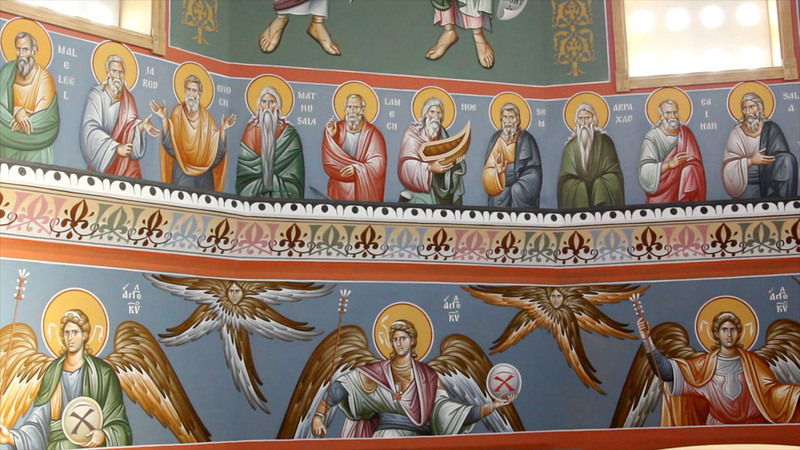 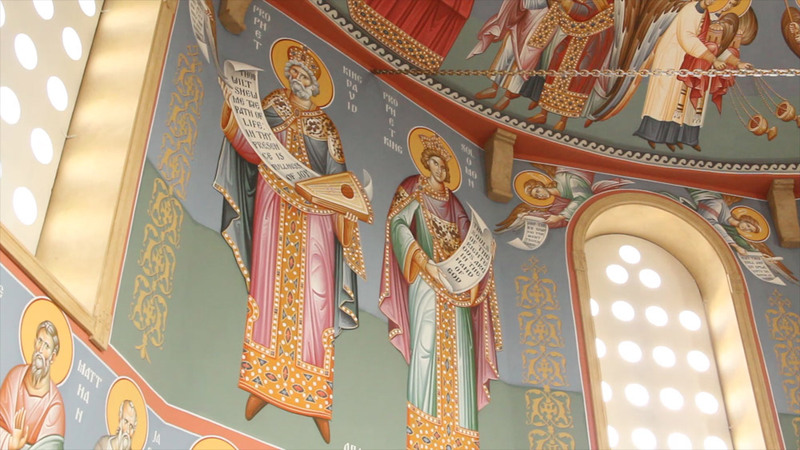 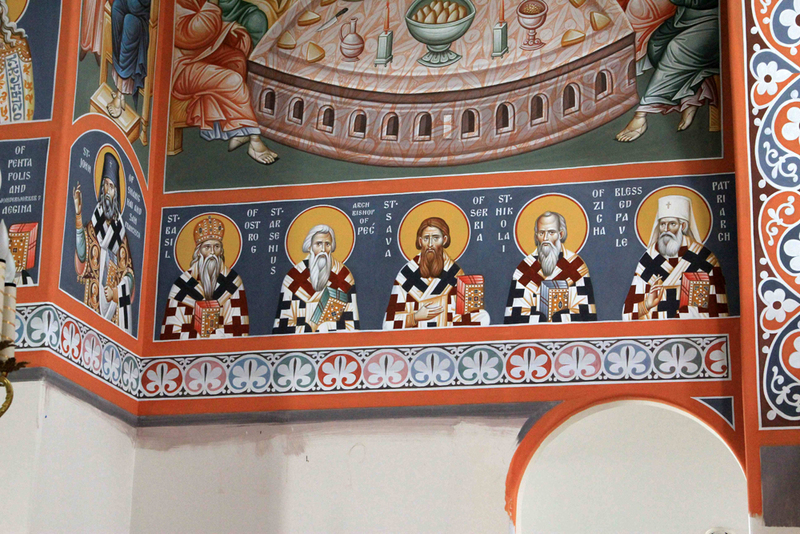 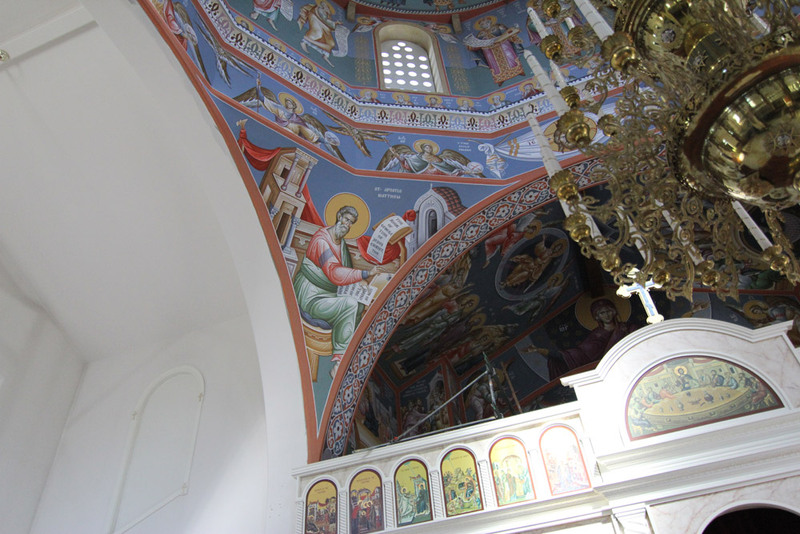 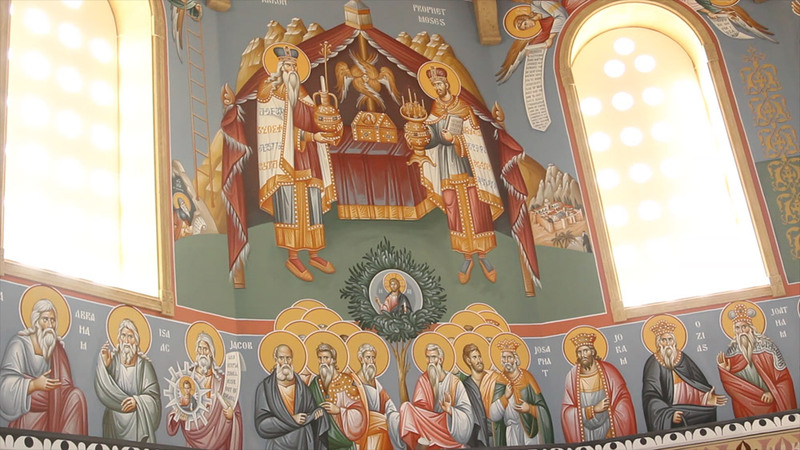 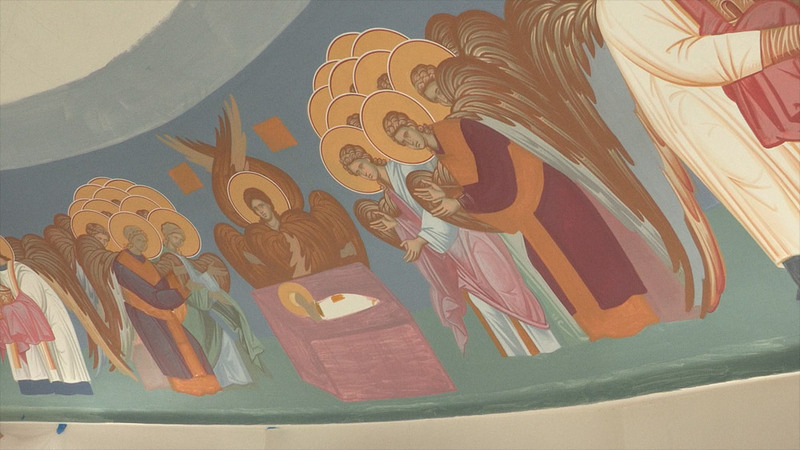 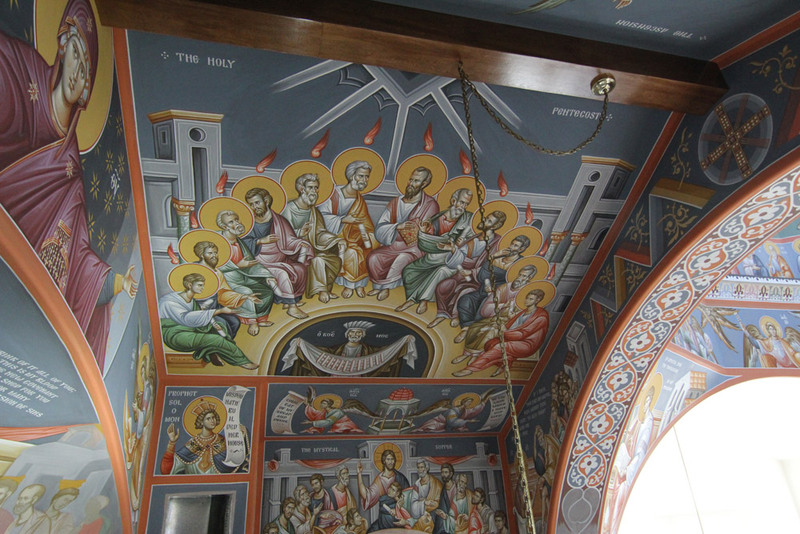 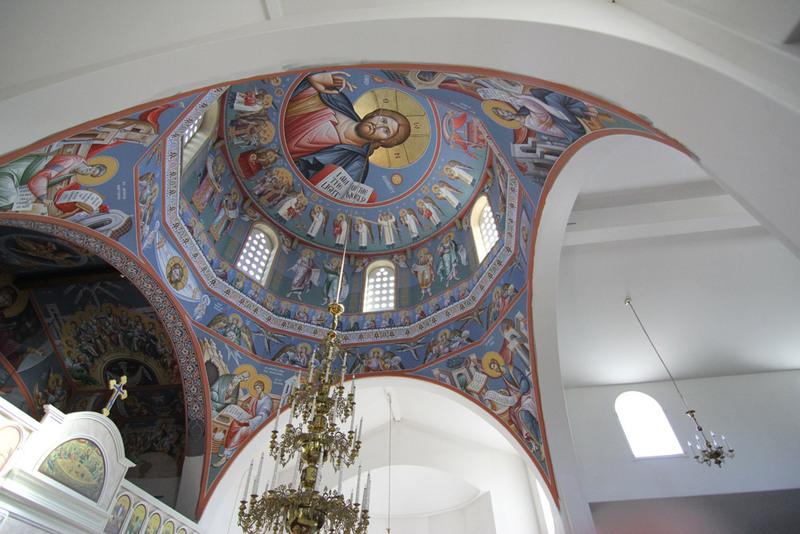 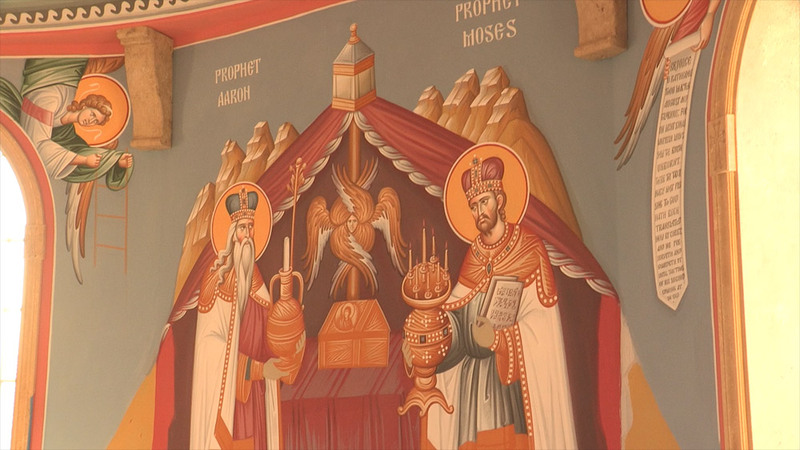 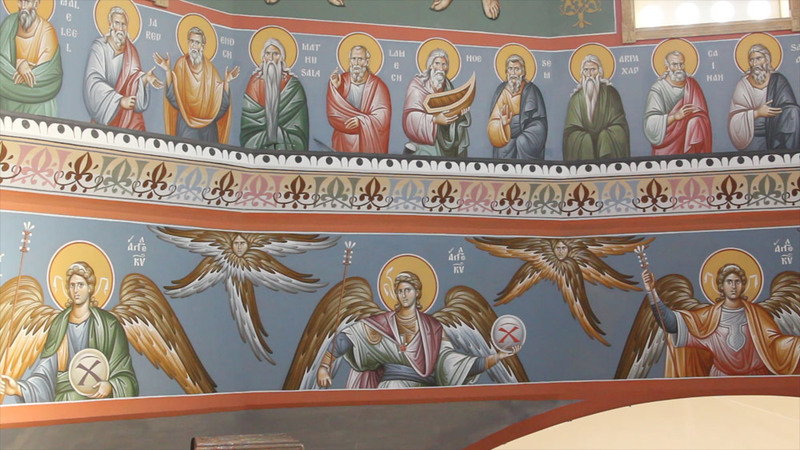 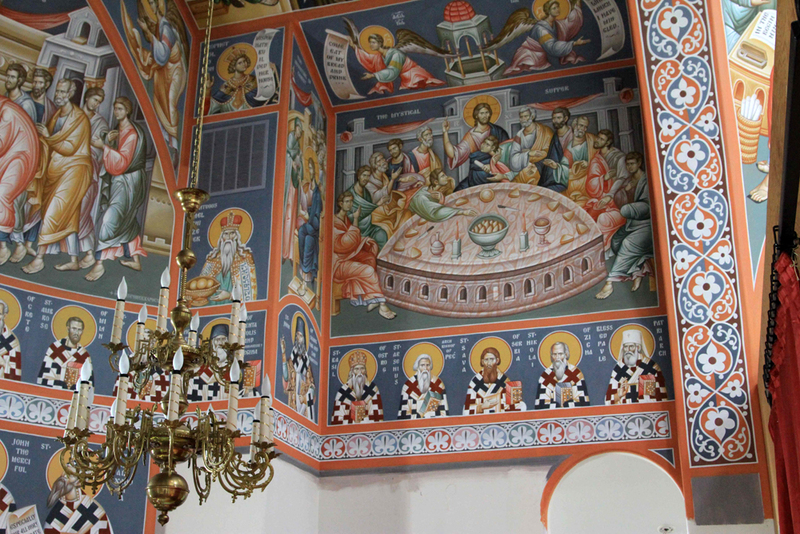 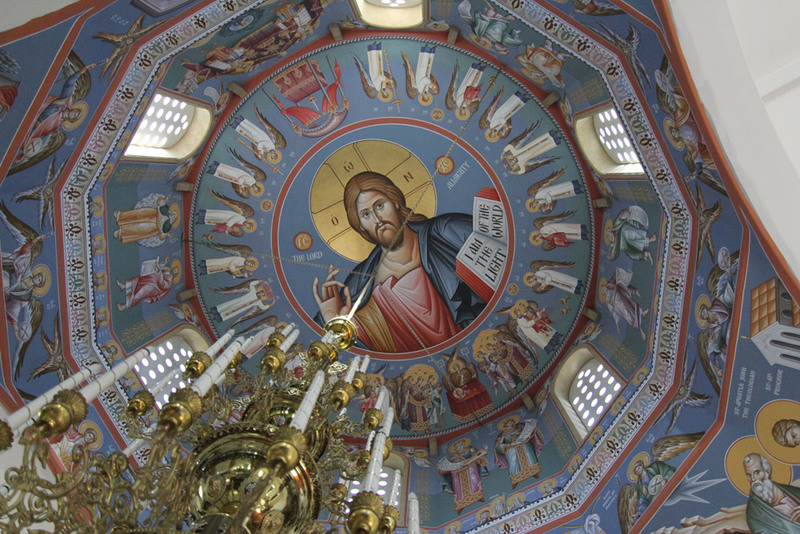 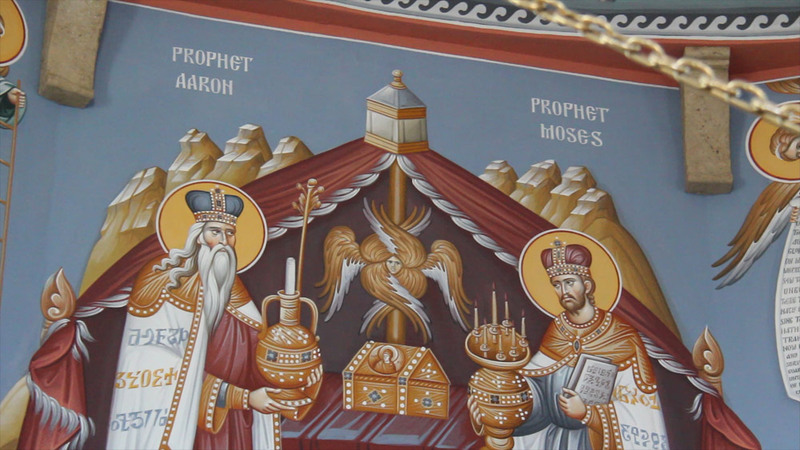 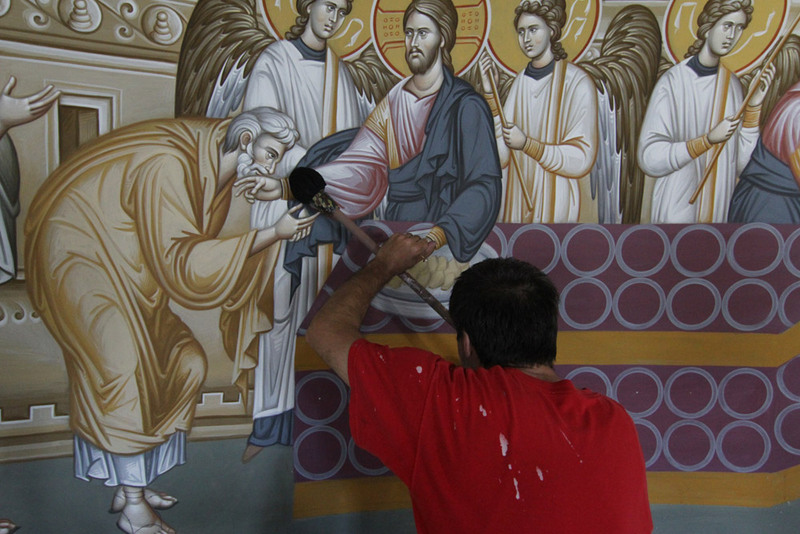 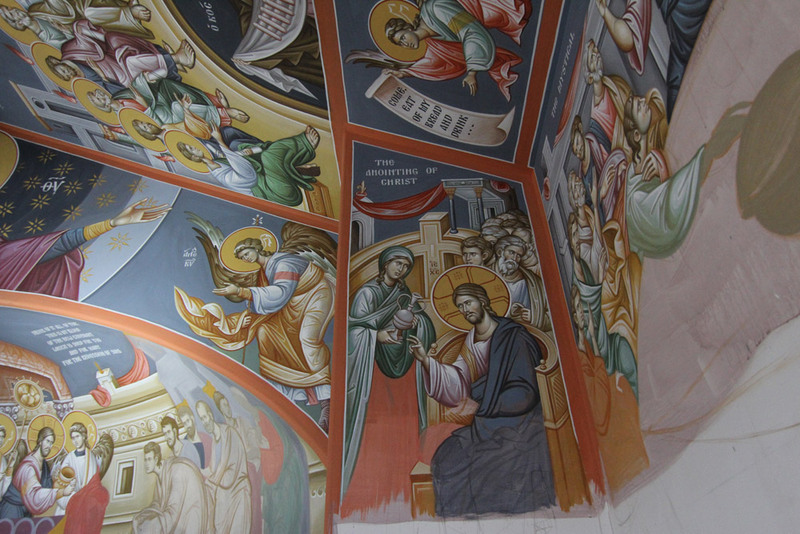 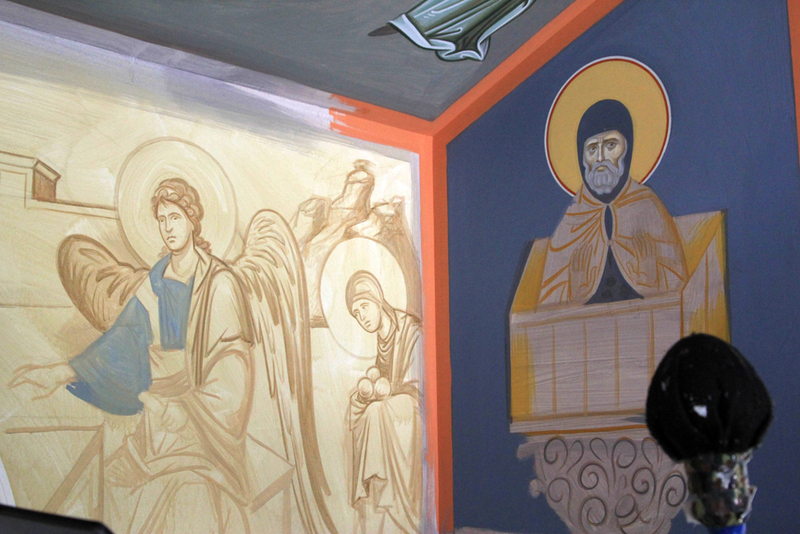 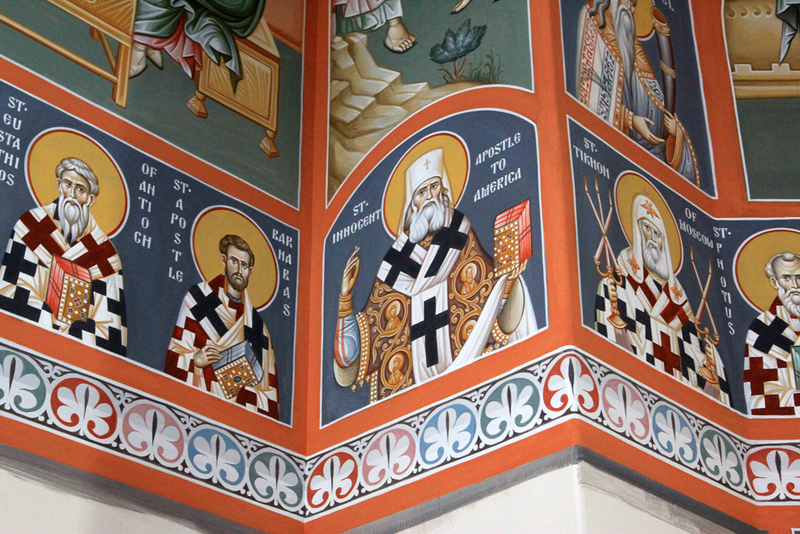 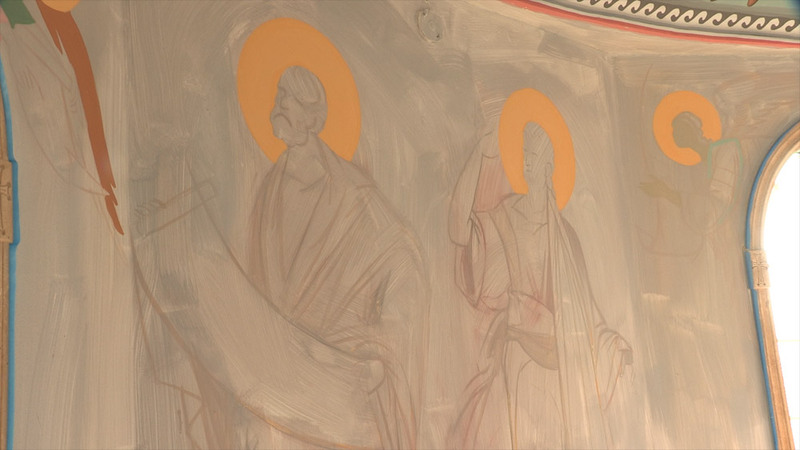 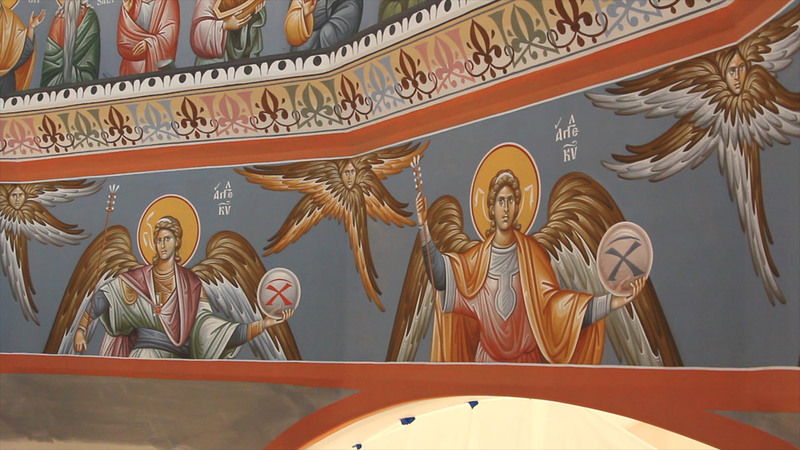 The Church had been adorned by Ugljesa and other associates from Belgrade. 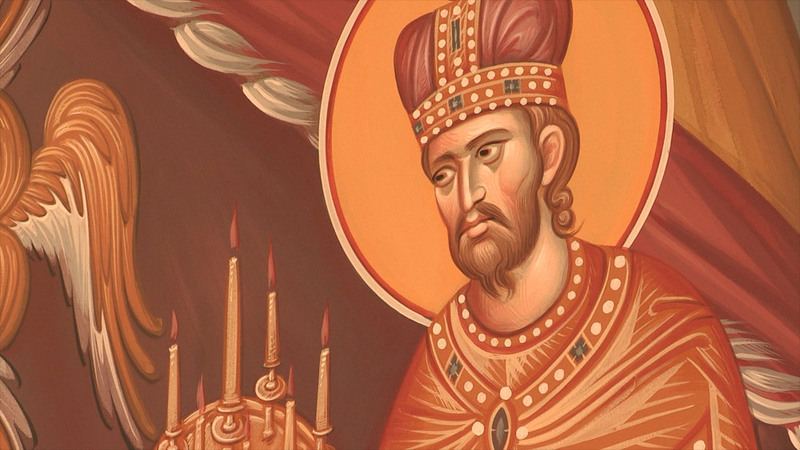 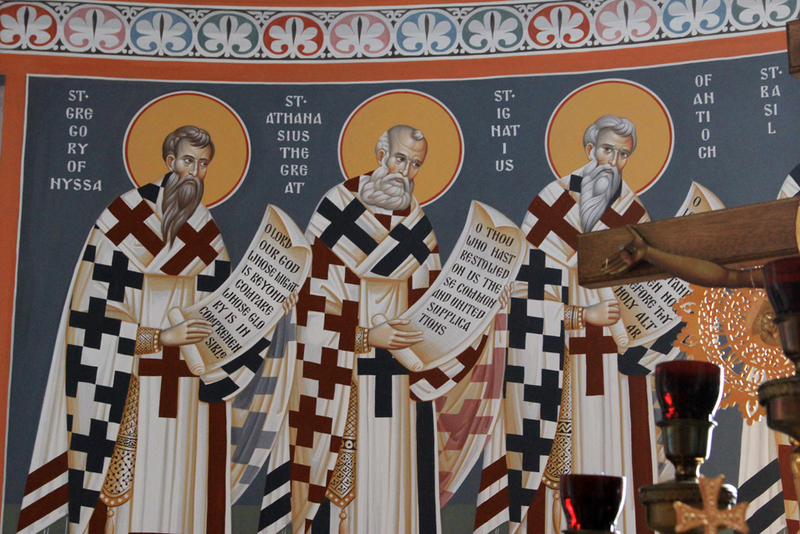 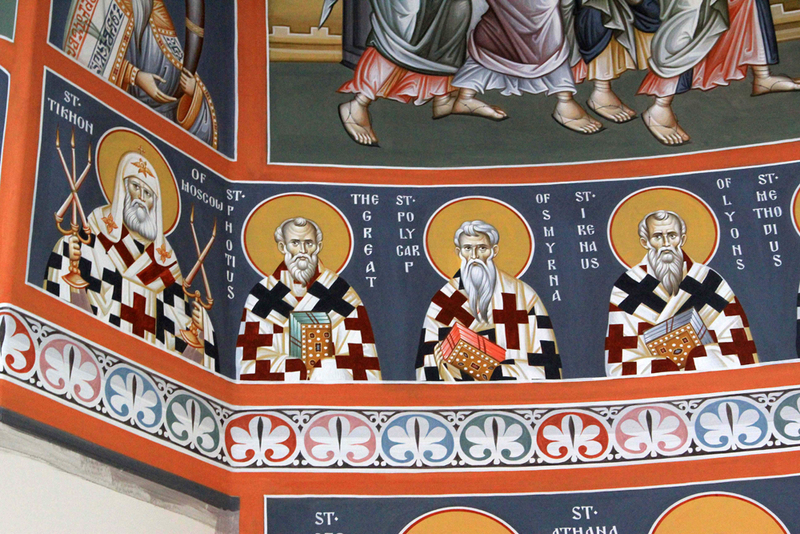 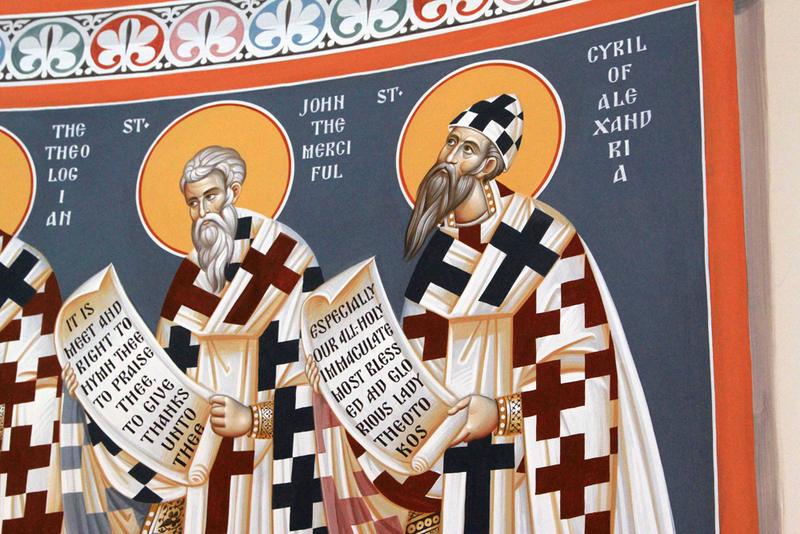 I am not a byzantine icon expert, but I could tell from what little knowledge I had that these people have a love for the Tradition of the Church... that they were intent on following the Apostolic command, “Therefore, brethren, stand fast, and hold the traditions which ye have been taught... ”. 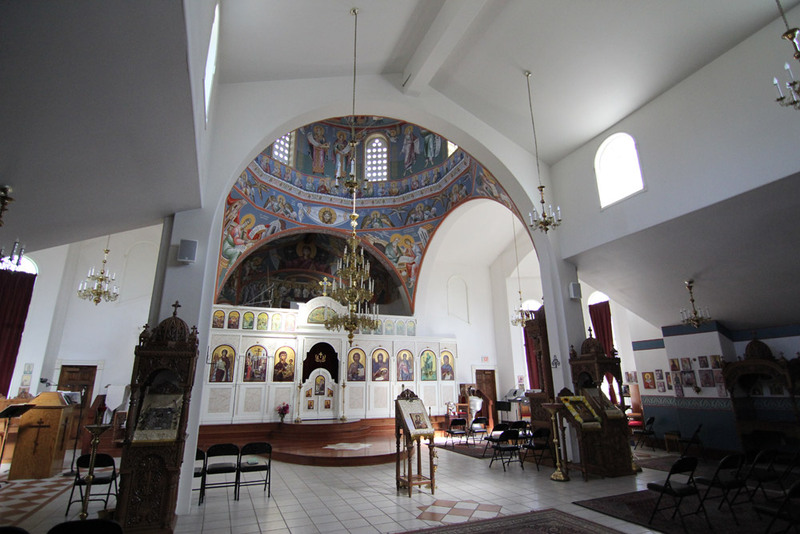 Our correspondence and perseverance with the visa process finally resulted in their arrival in Yakima and the beginning of this great effort during Bright Week of 2012. 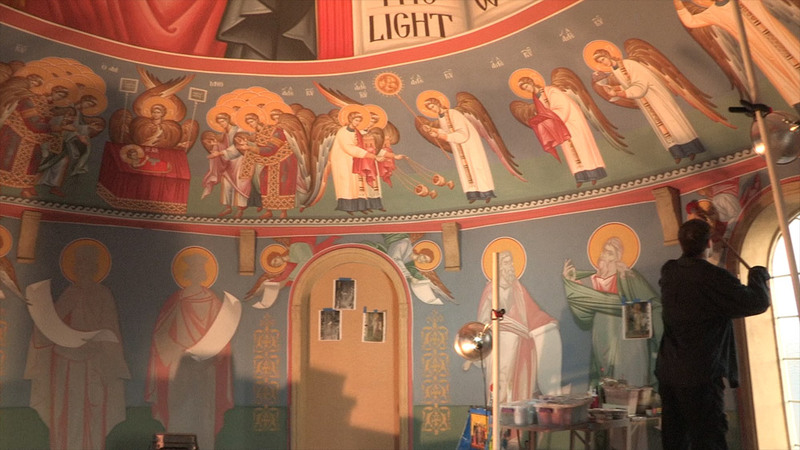 Twenty-five years ago now our small parish was received by His Eminence Metropolitan PHILIP into the communion of the Antiochian Orthodox Church. 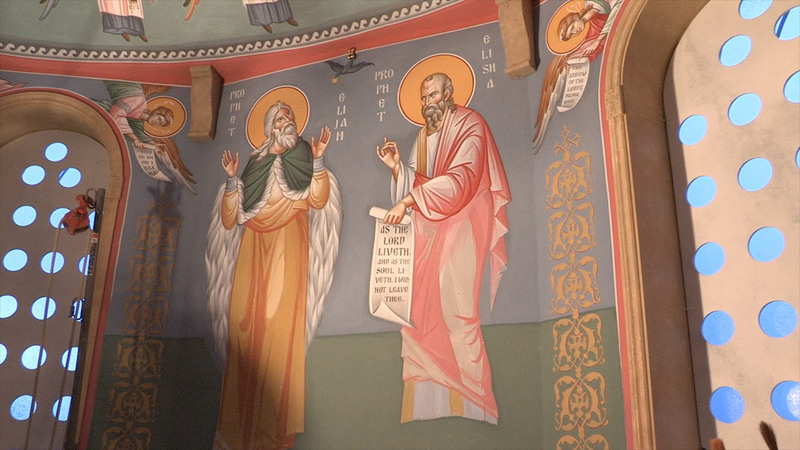 This meant that we had entered the historic Apostolic Church in the very place that believers had first been called “Christians” almost 2000 years ago. 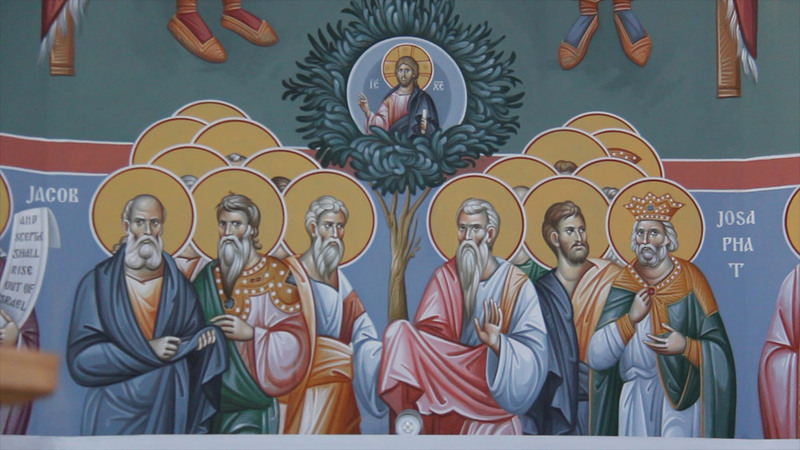 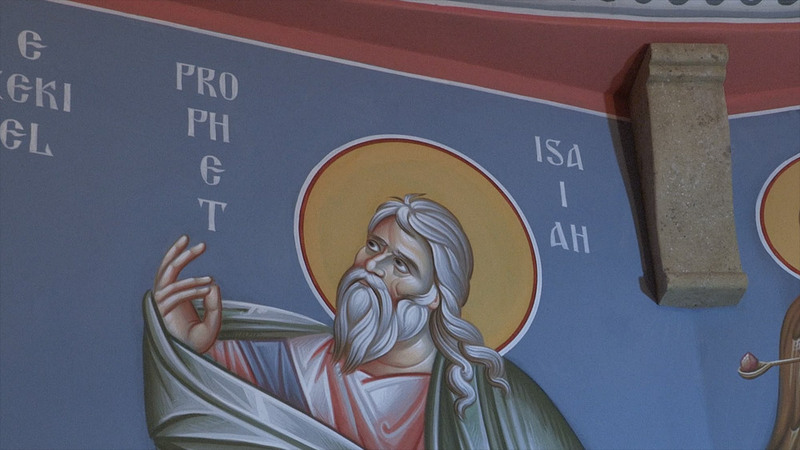 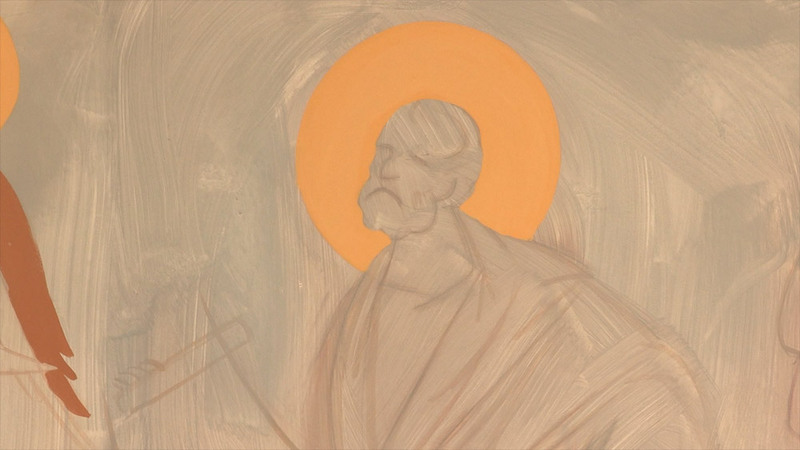 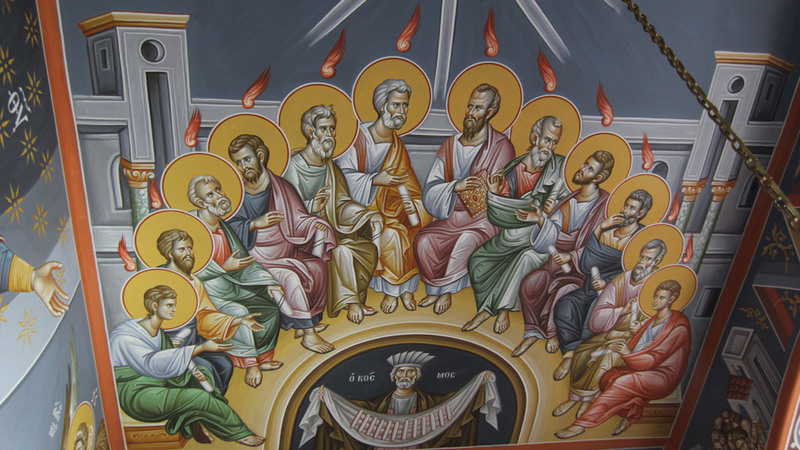 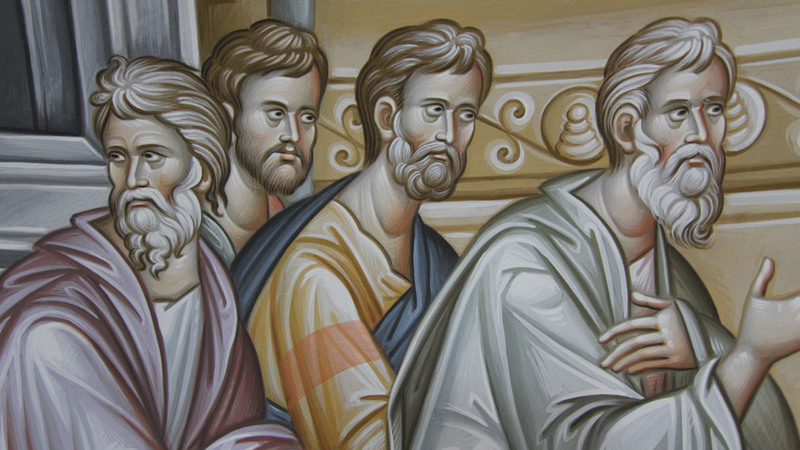 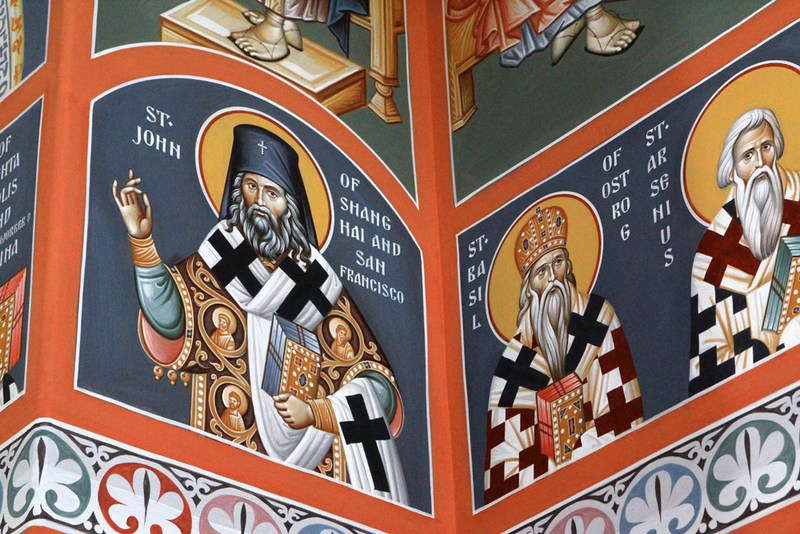 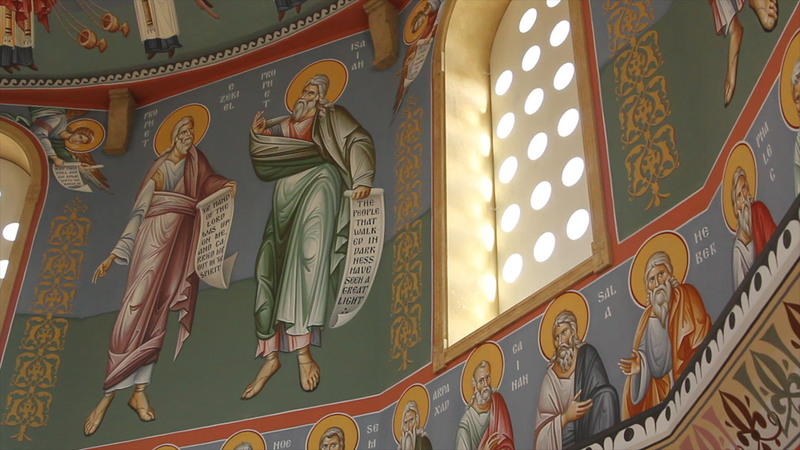 One does not enter the Orthodox Church and according to our preferences attempt to shape and form its ethos, its cultural predisposition, primarily the “way things are done”, handed down by the Apostles themselves, . 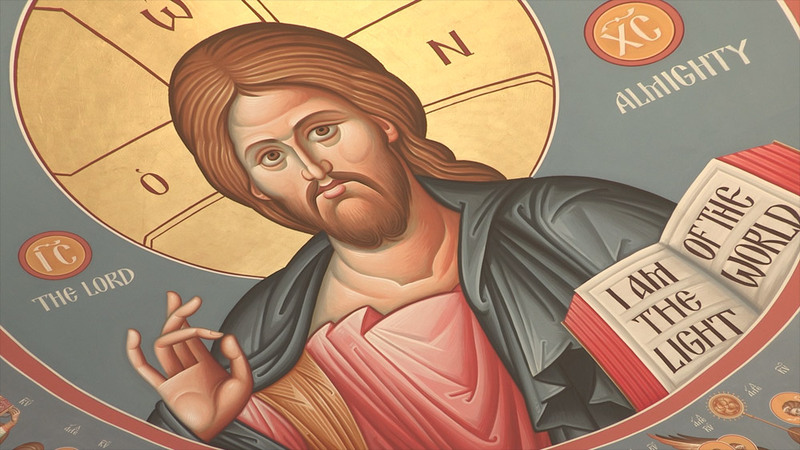 We must be shaped and formed by the ethos of the Church; its sights, sounds, smells, actions, auditory features and etiquette...its ways. 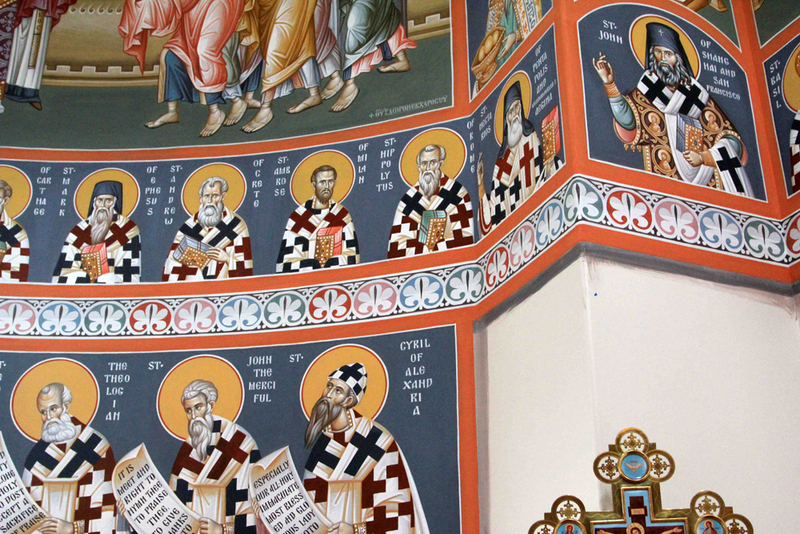 We no more adapt the theology of the Church to our way of thinking than we design the ethos of the Church to fit our aesthetic predispositions. 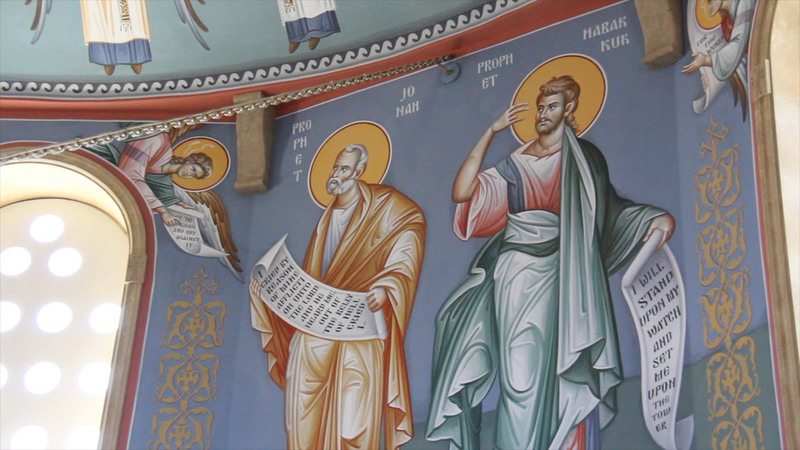 The theology of the Church is an Apostolic gift just as the sound and content of ecclesiastical hymnody was revealed to the Church from the Old Testament through the New Testament and throughout the ages of the Church by many heavenly and miraculous visitations. 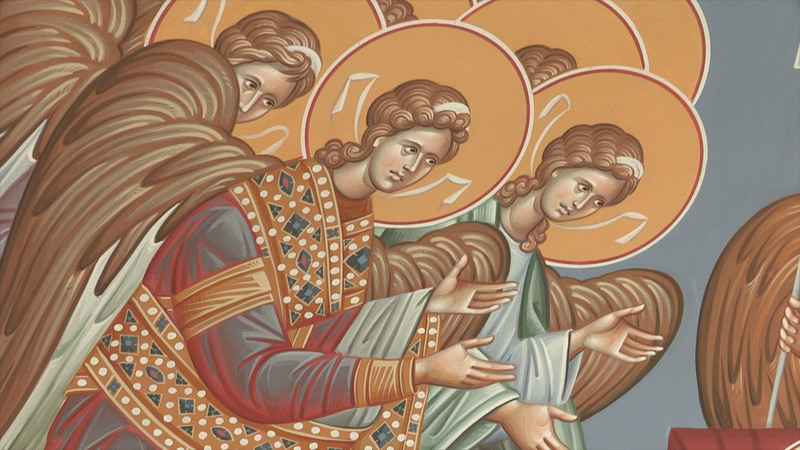 These visitations have revealed the ethos, the heavenly content and sound of our hymnody. 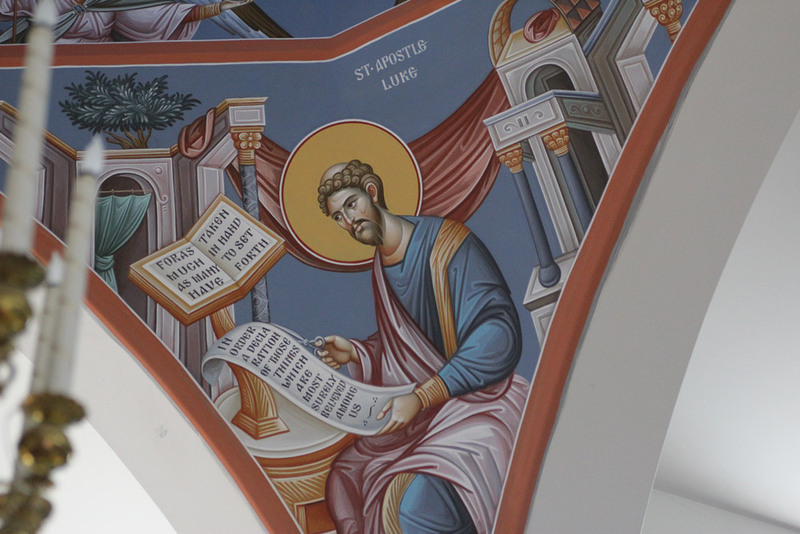 This way of doing Church hymnody is part of the transforming power of holding to, “ ...the traditions which ye have been taught... ” and allowing them to transform our preferences and predispositions. 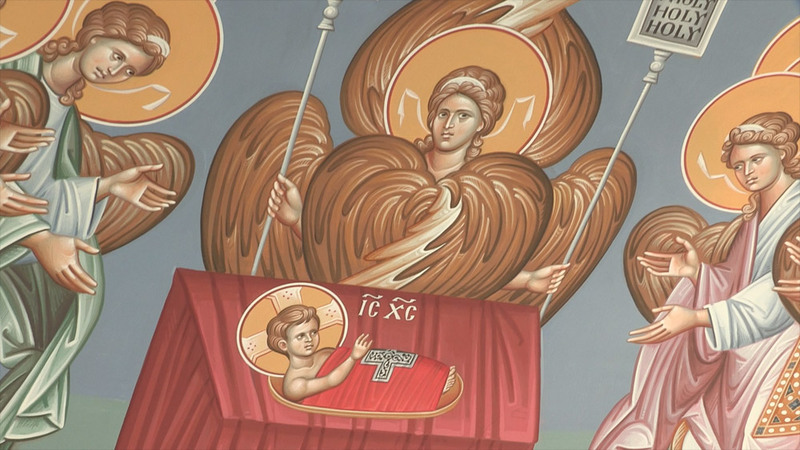 Iconography is like that as well. 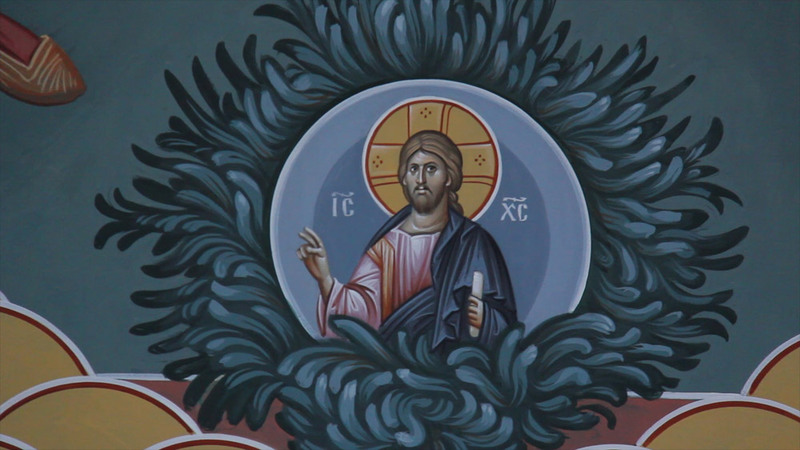 We do not shape and form it according to our own image. 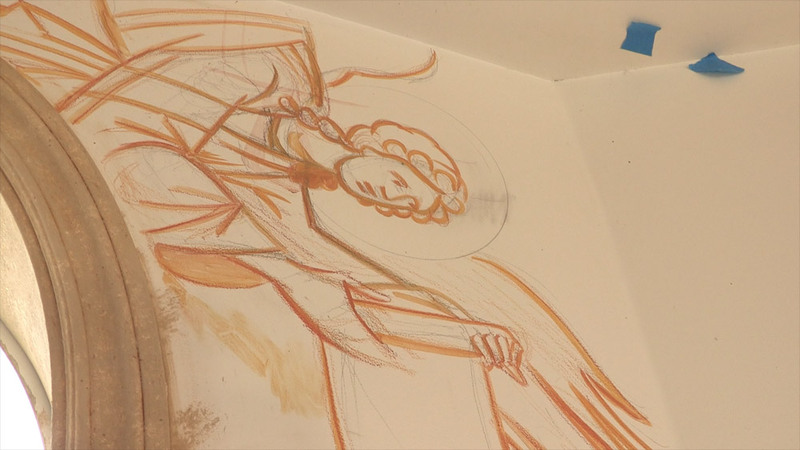 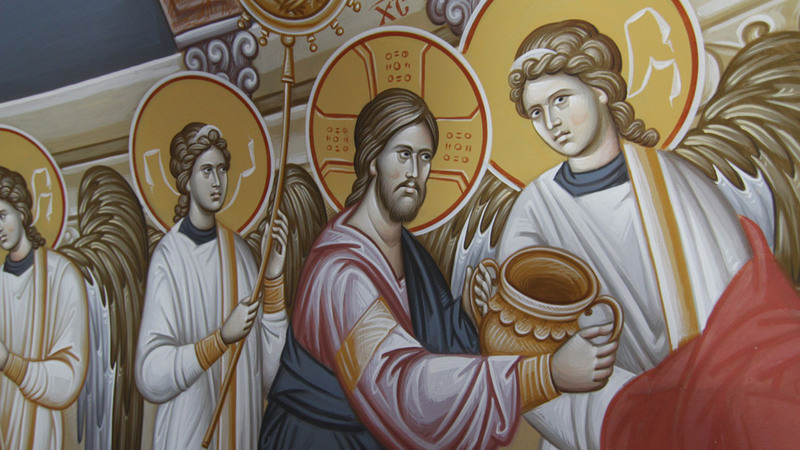 Rather, we are shaped and formed by the grace of God flowing from this iconographic tradition. 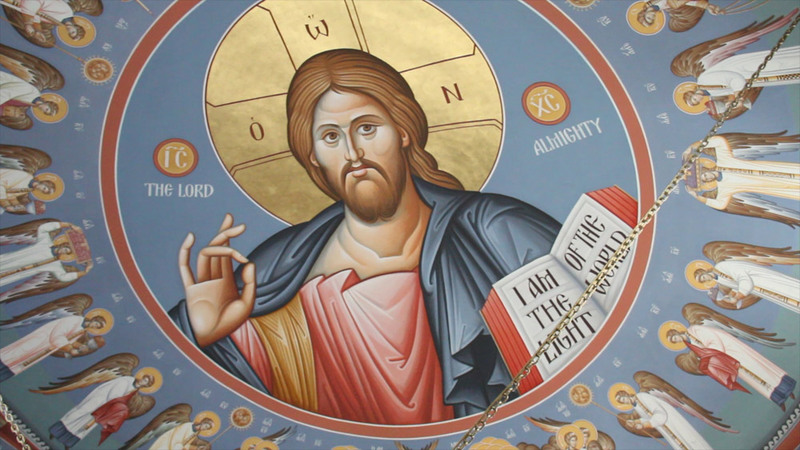 This is the ethos of the Church in shapes and colors that bends our attention toward seeking “ ...first the kingdom of God and His righteousness...”. 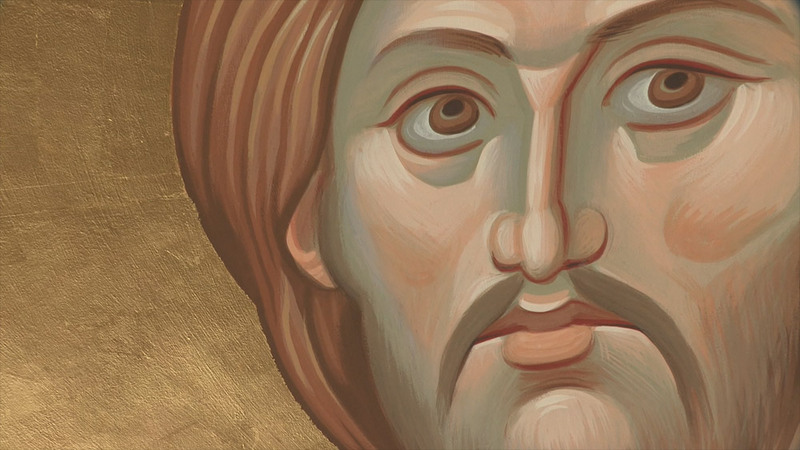 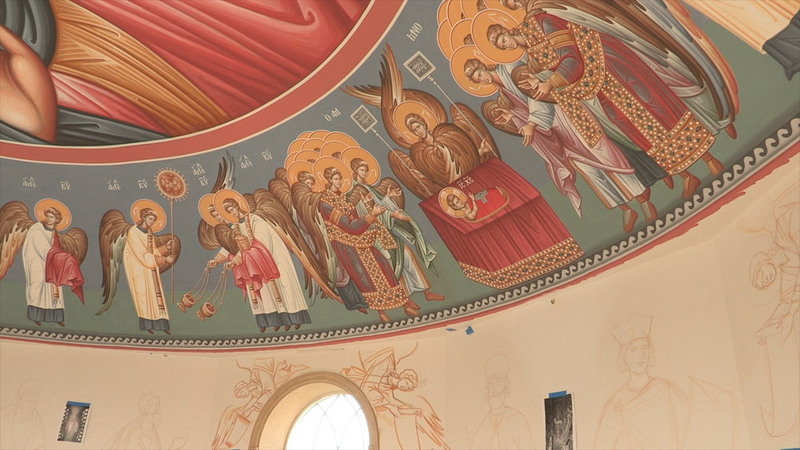 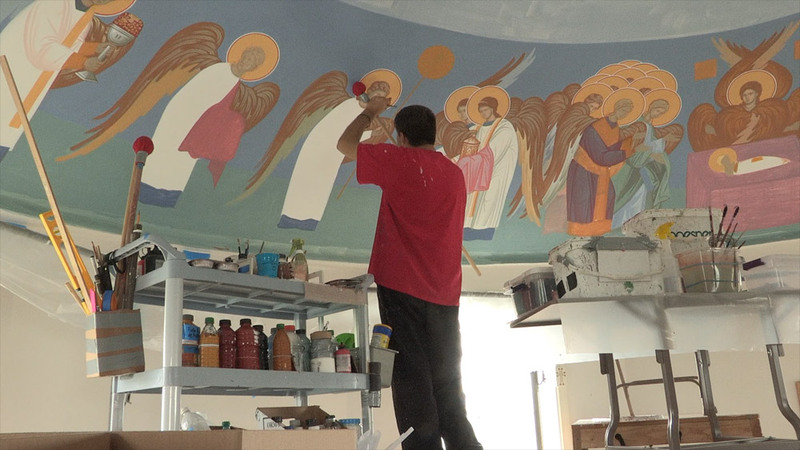 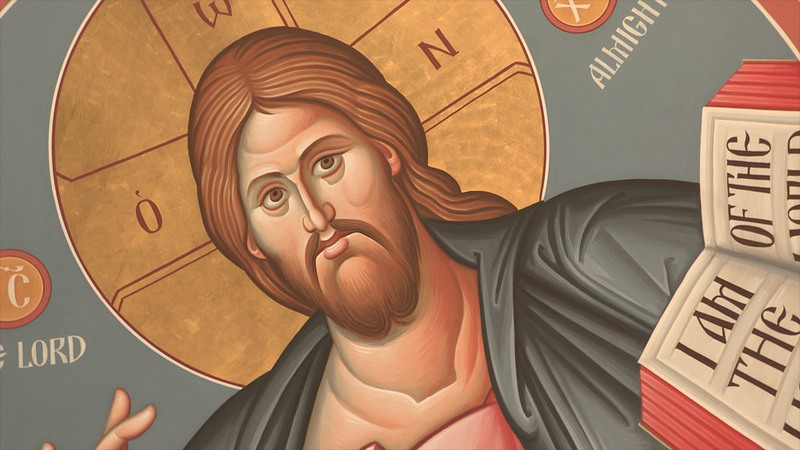 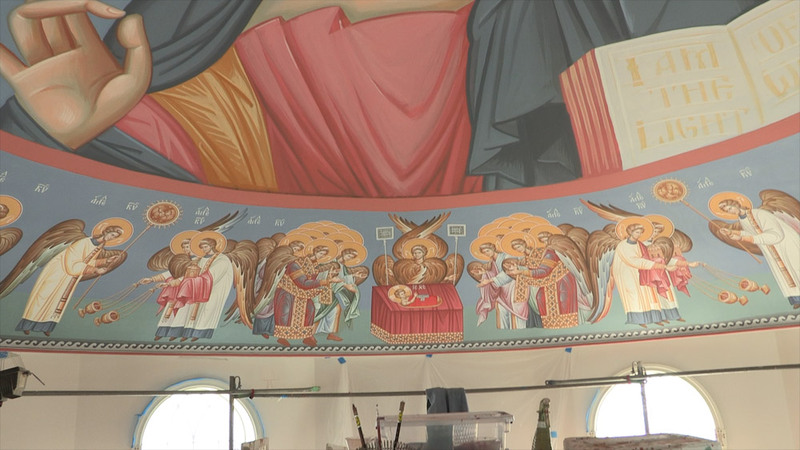 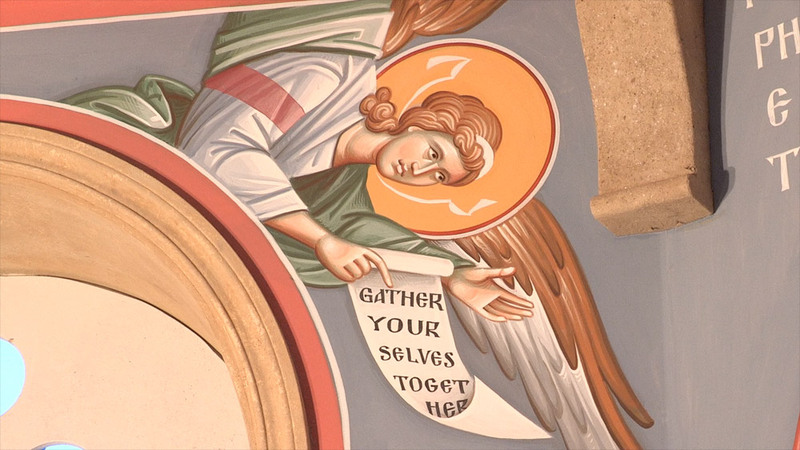 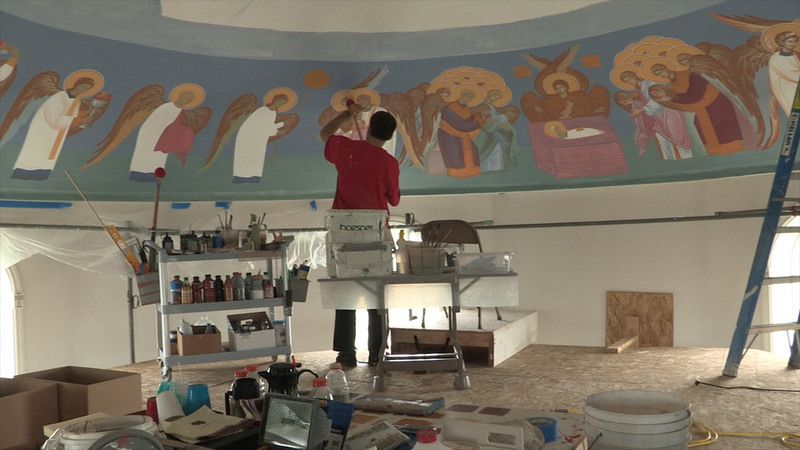 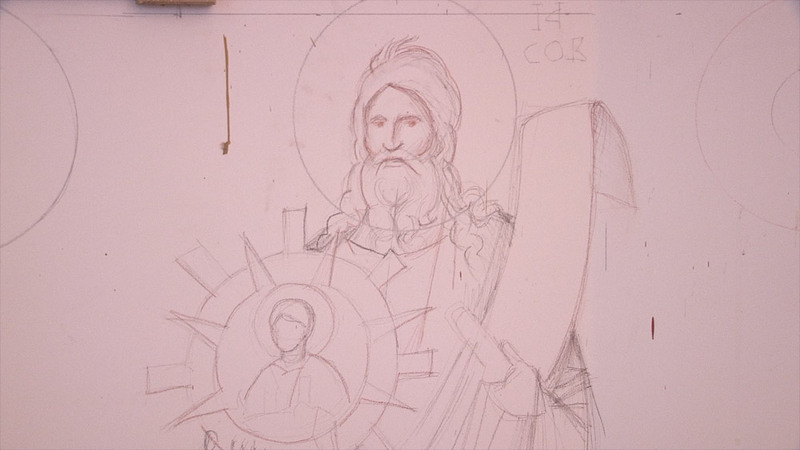 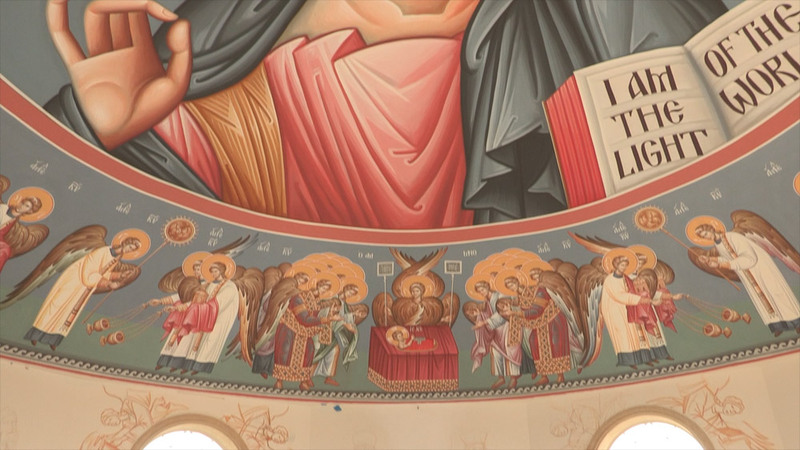 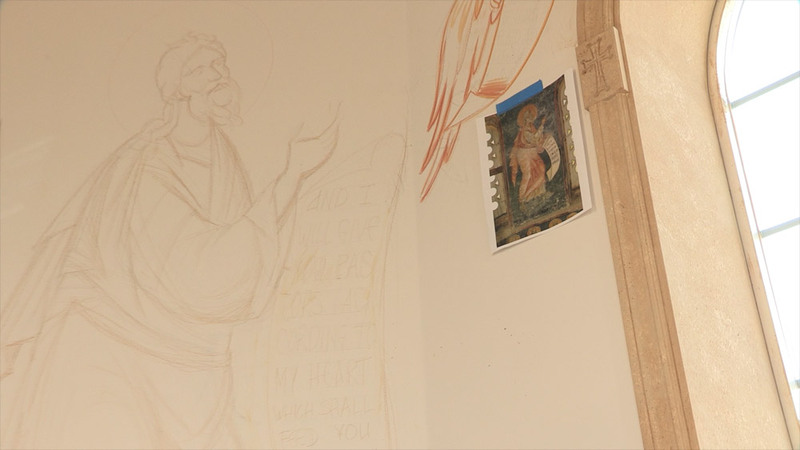 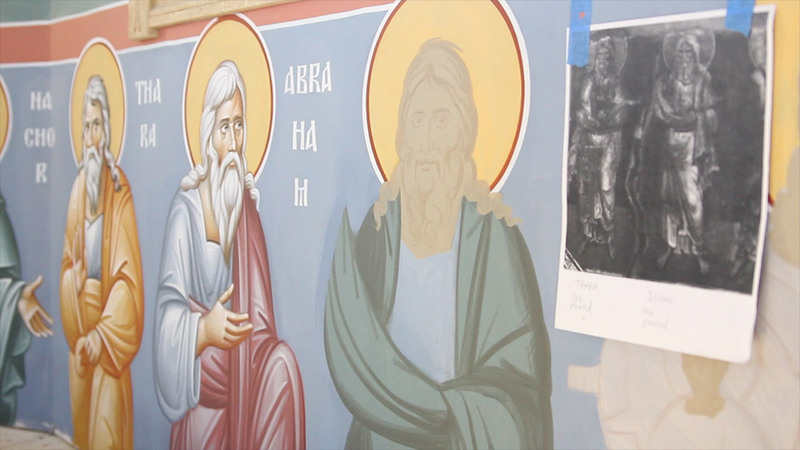 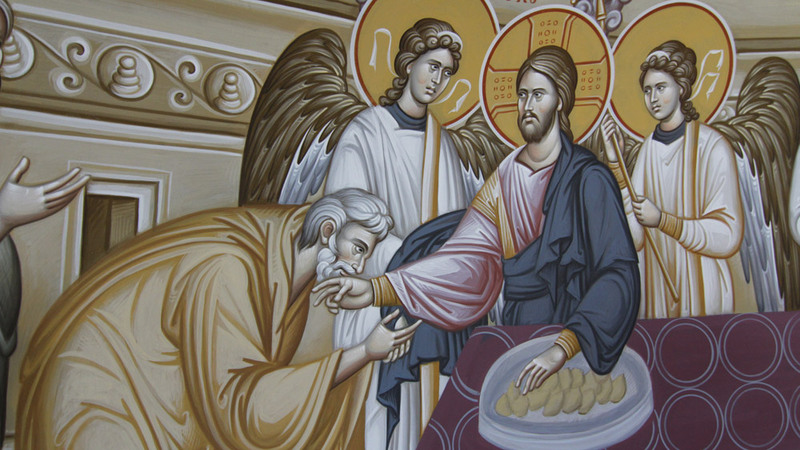 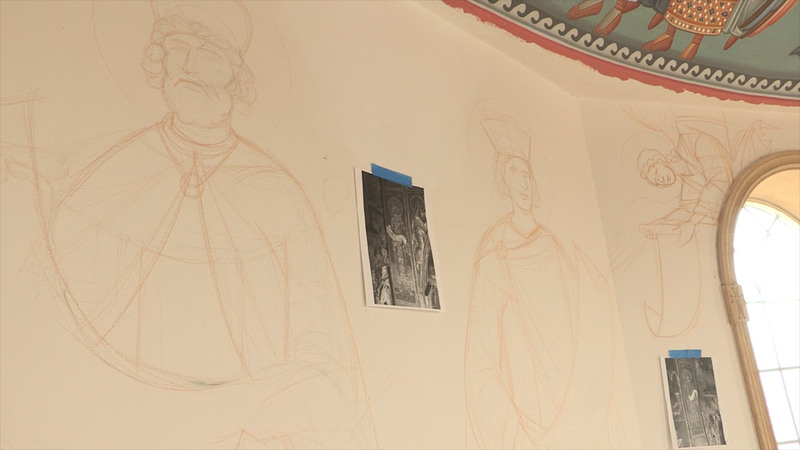 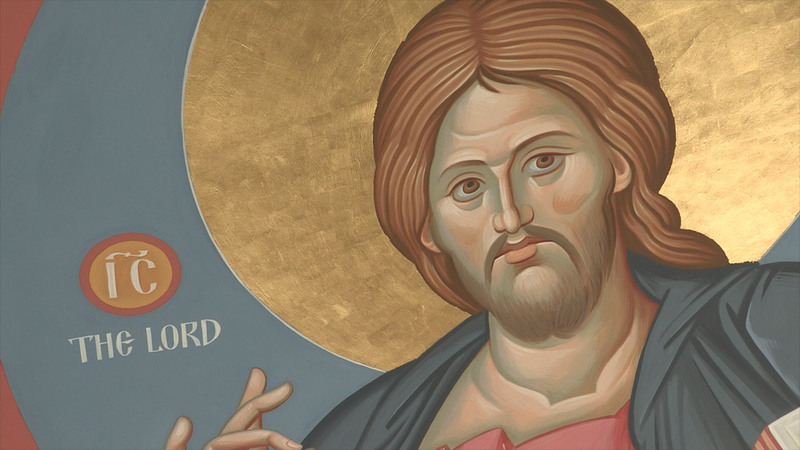 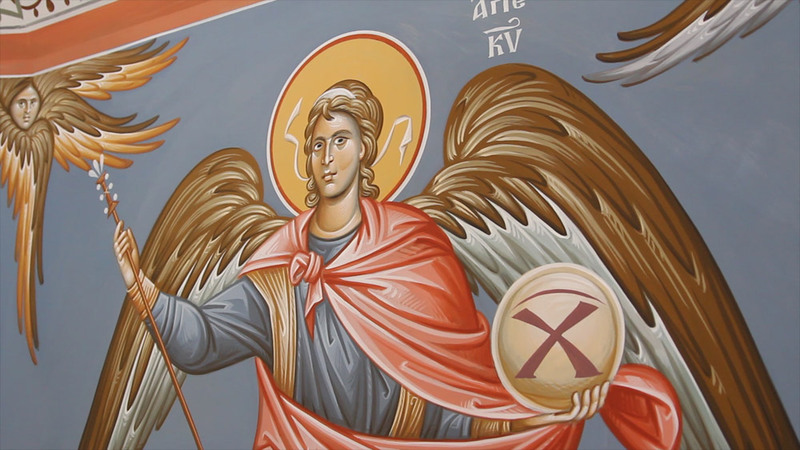 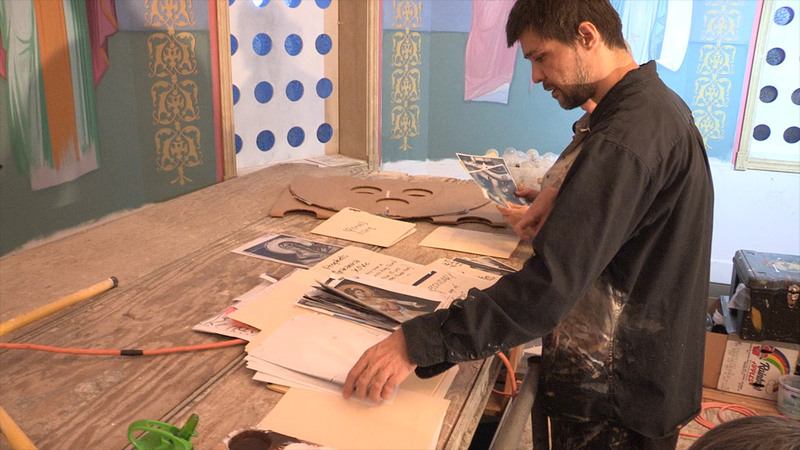 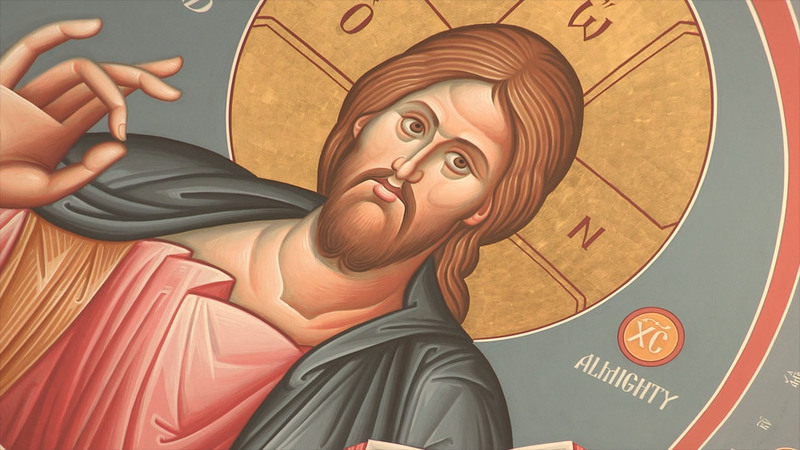 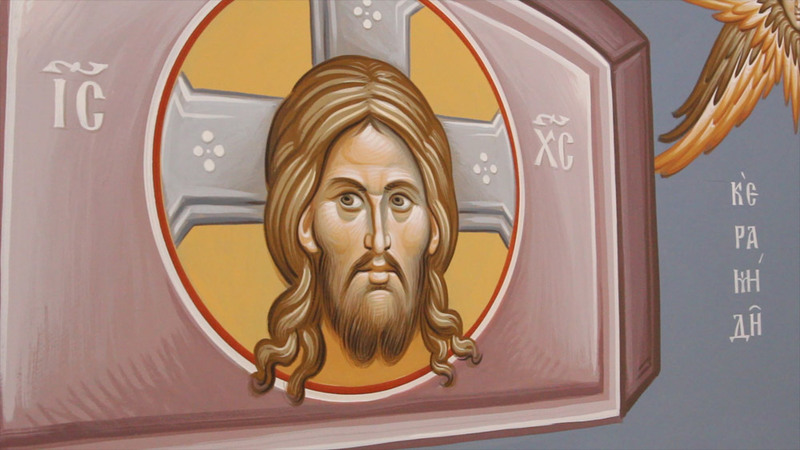 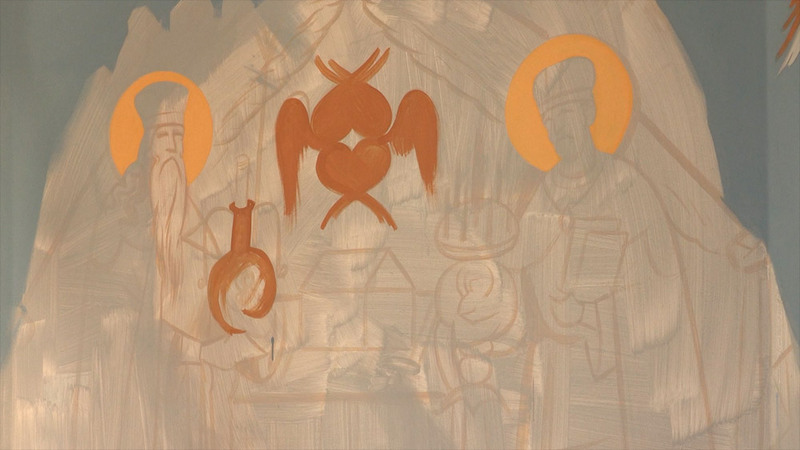 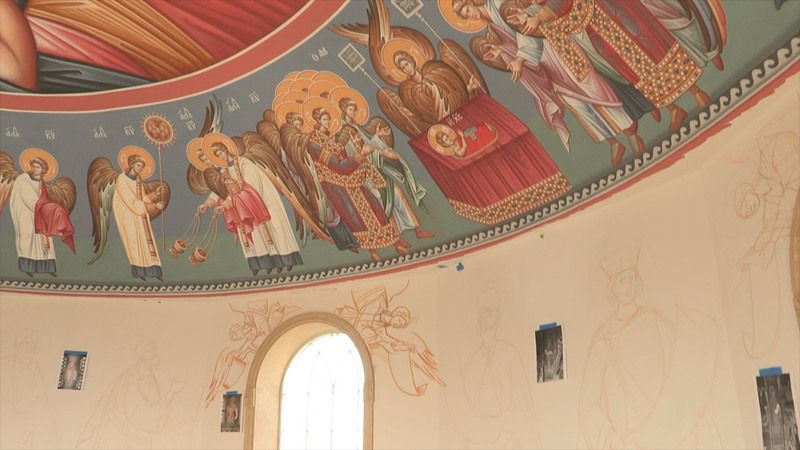 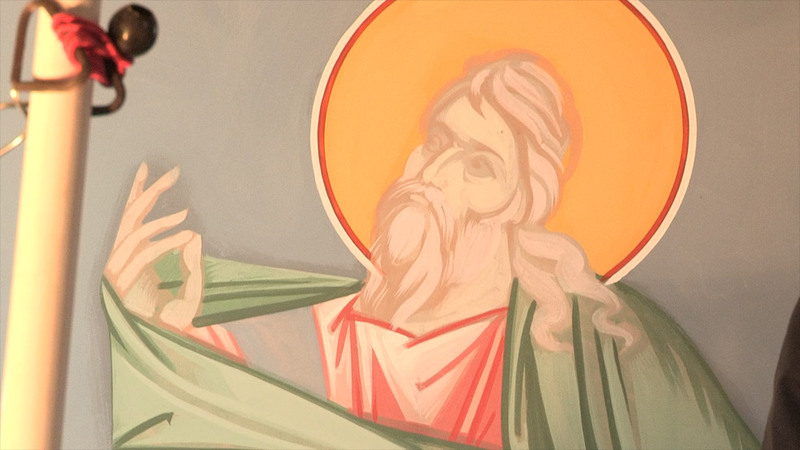 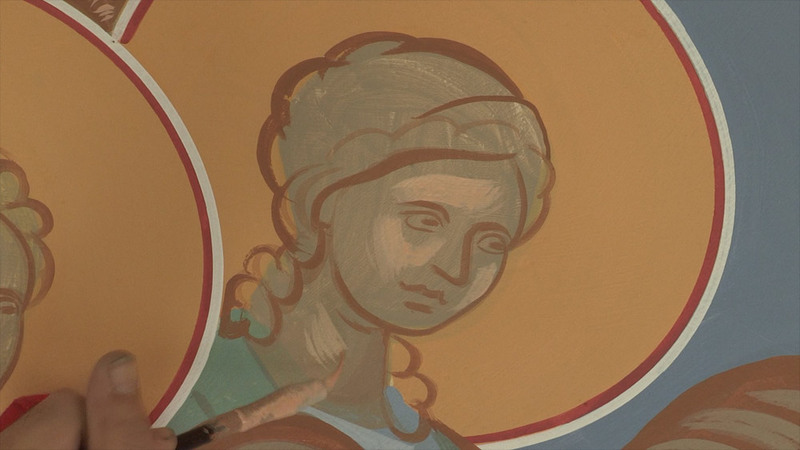 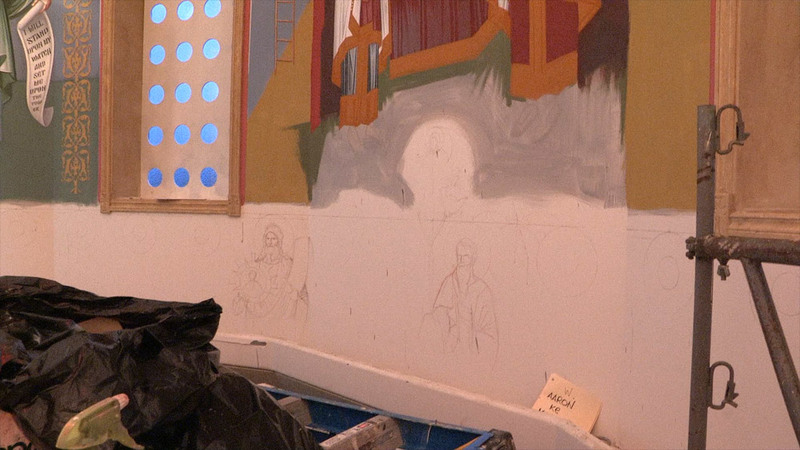 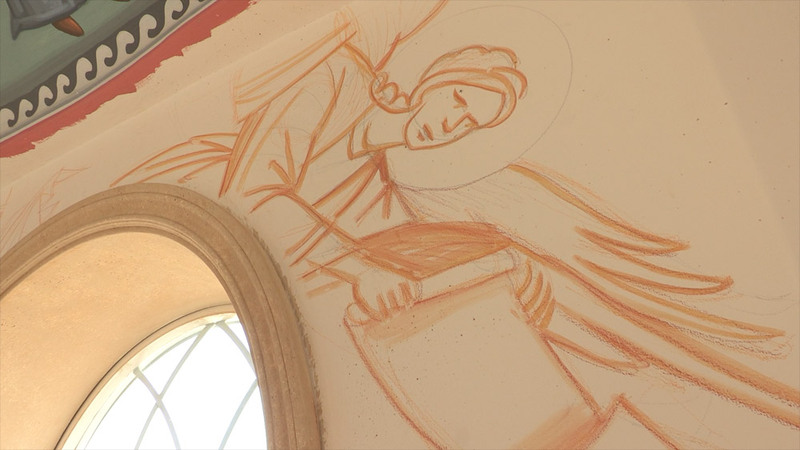 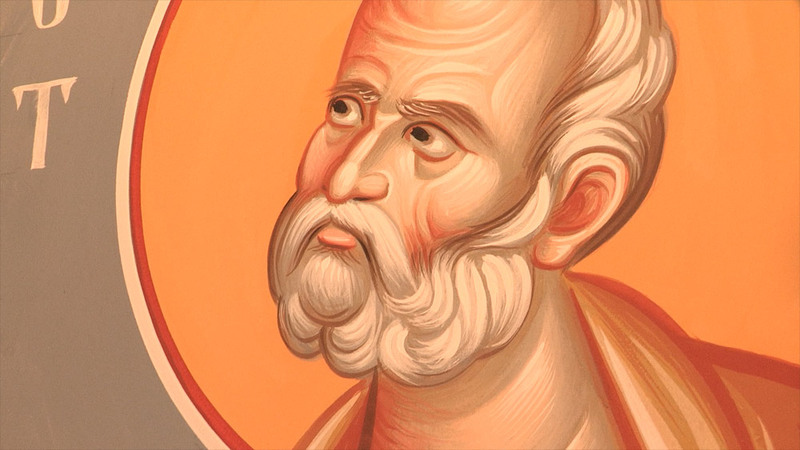 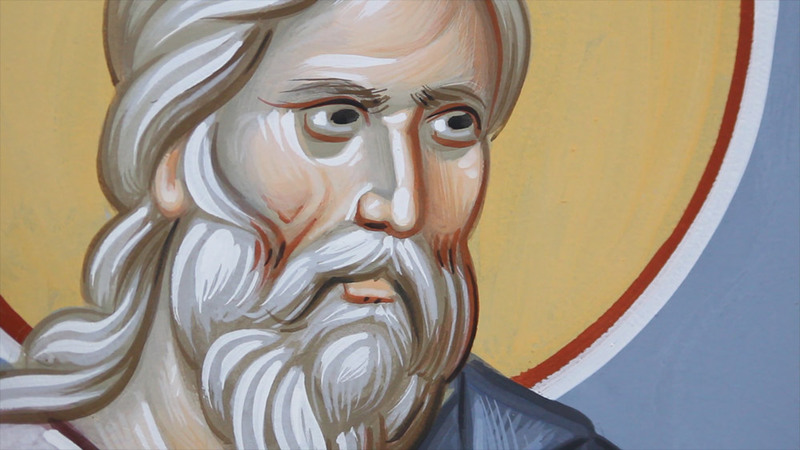 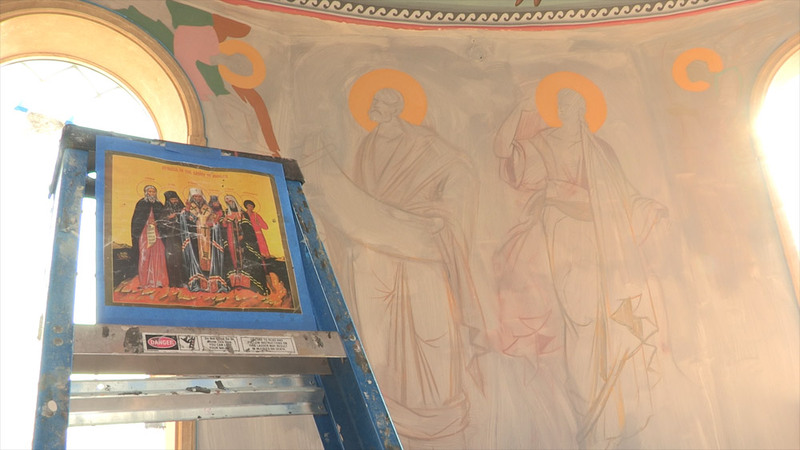 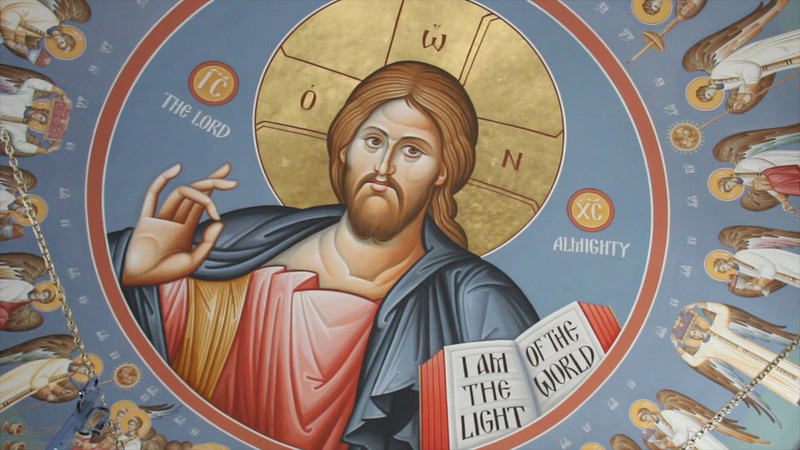 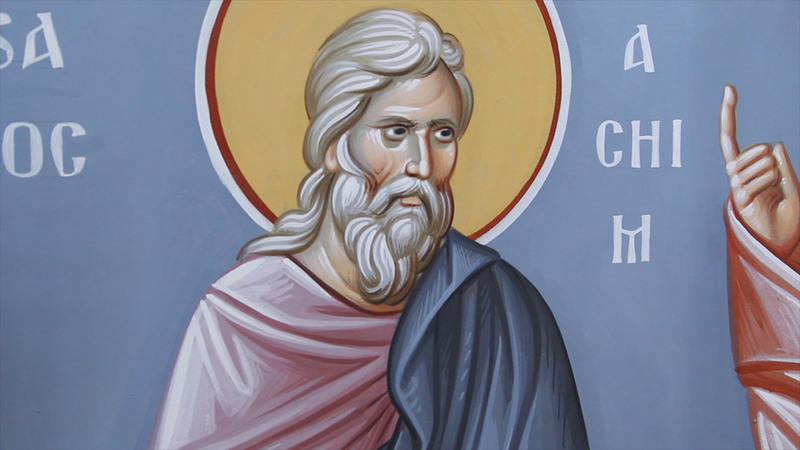 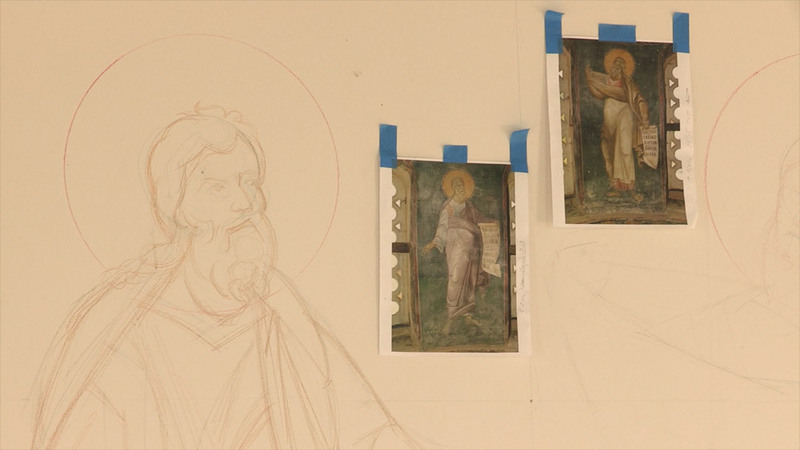 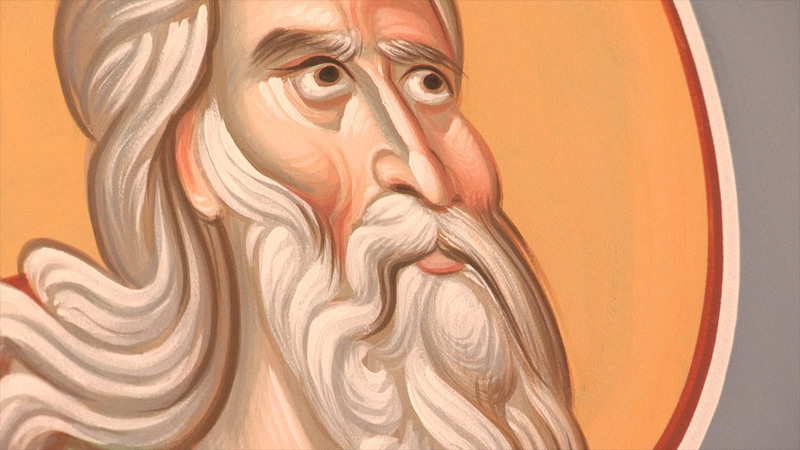 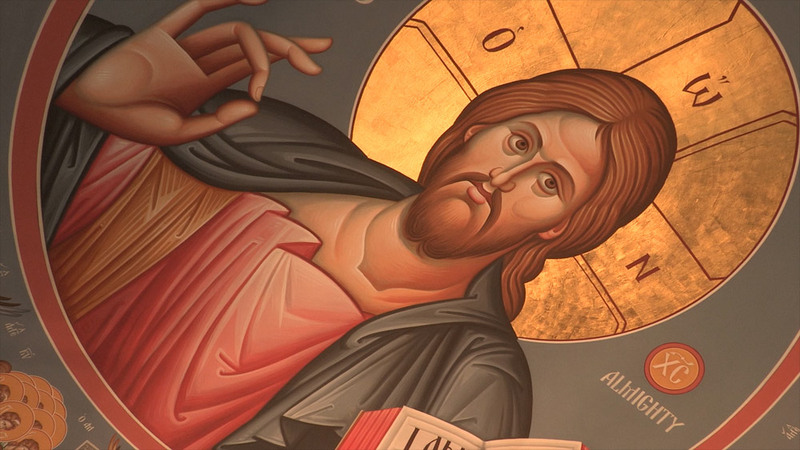 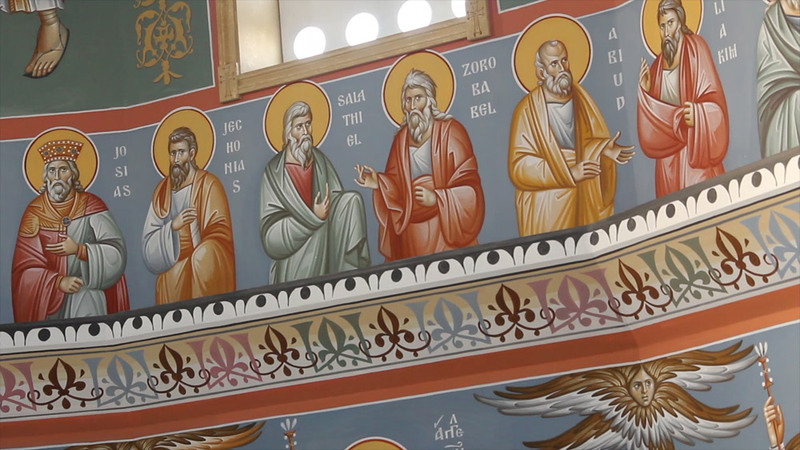 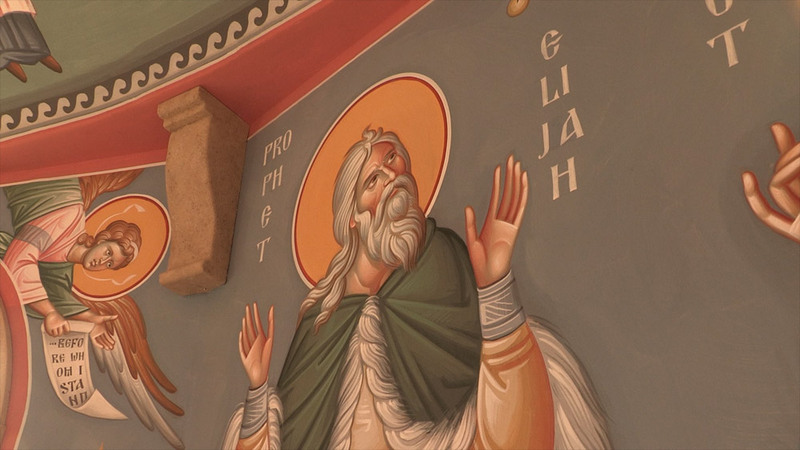 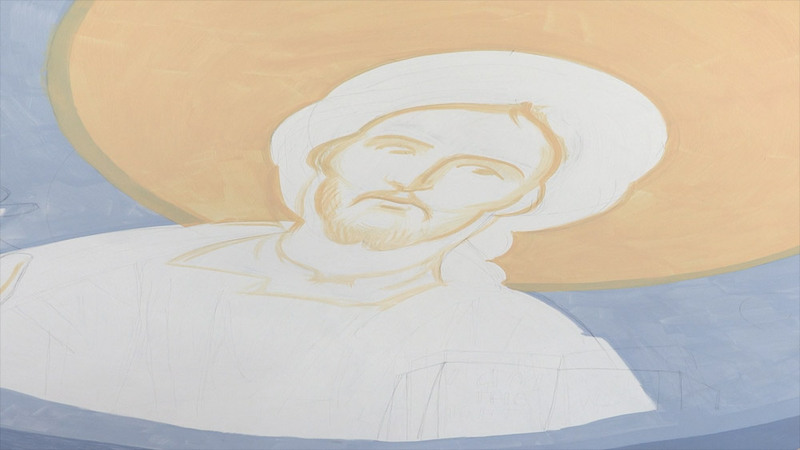 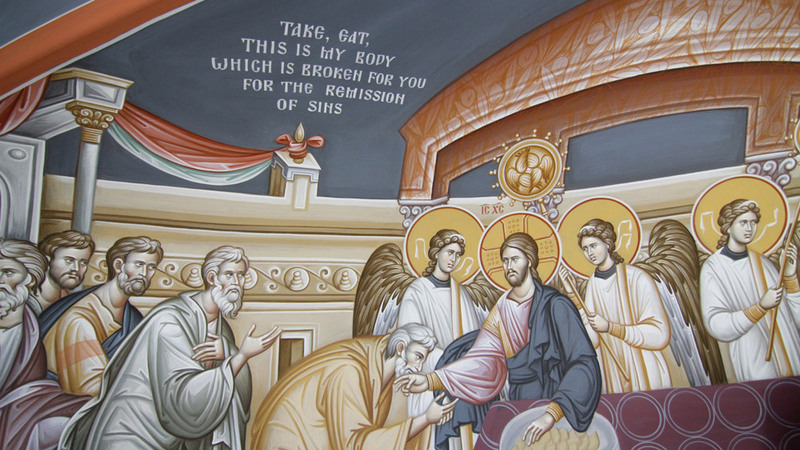 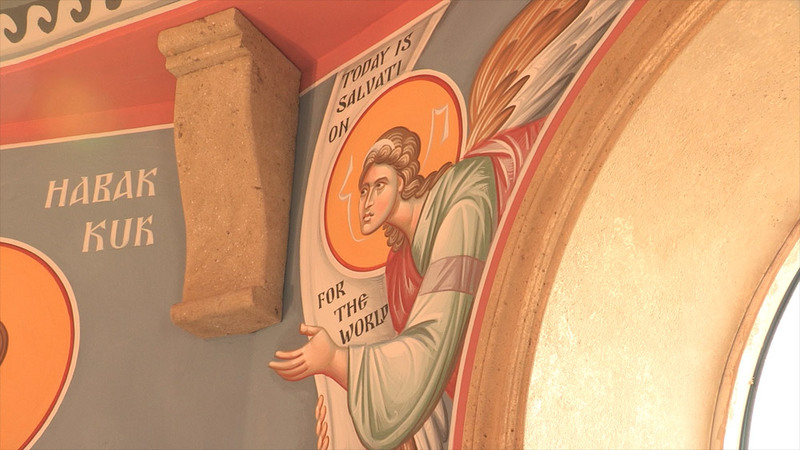 So, thank God, we have found some humble and masterful iconographers who desire with their hearts to adorn our temple with iconography that is faithful to the sacred traditions handed down to us. 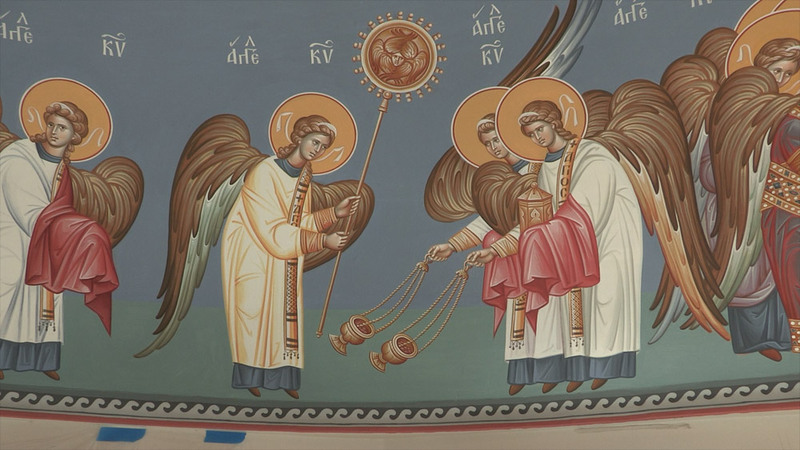 May this work reveal the very Glory of God in His Saints. 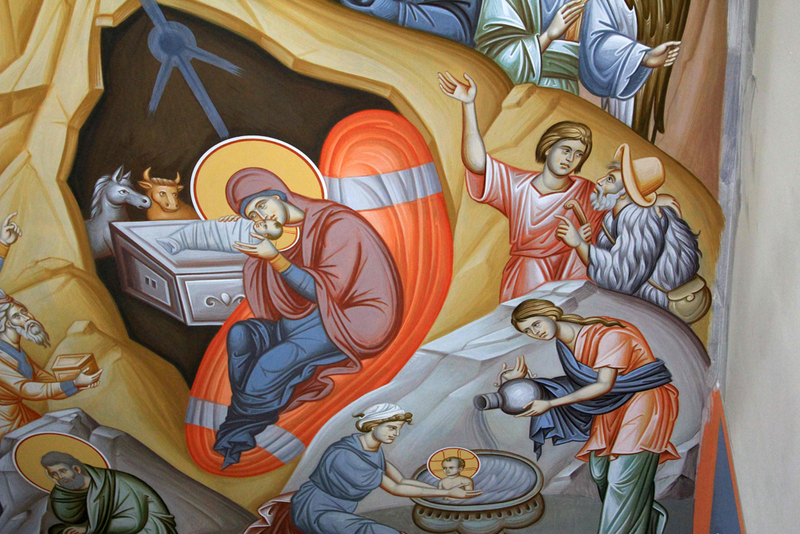 May it be filled with Divine Energy, the Uncreated Light, the very Power of God that flowed from His humanity, even His clothes, to heal the sick and raise the dead. 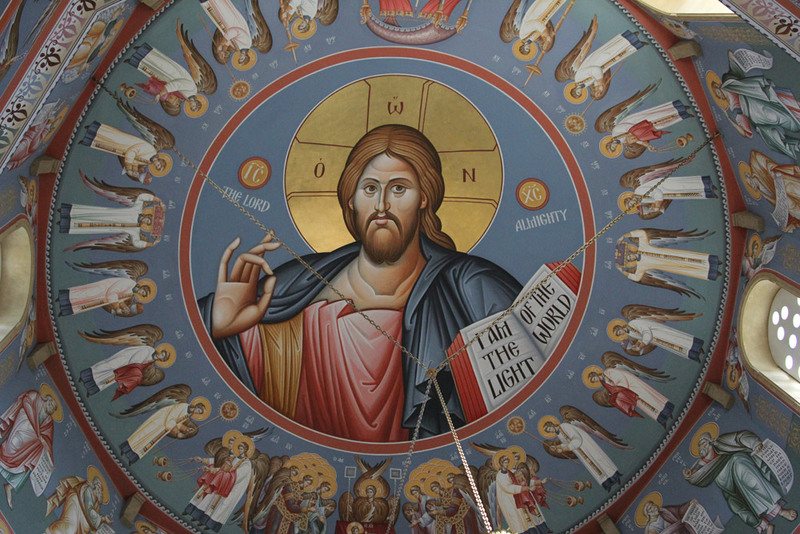 May this Light penetrate us who stand together in His Holy Temple in worship, “...who love the beauty of Thy house”. 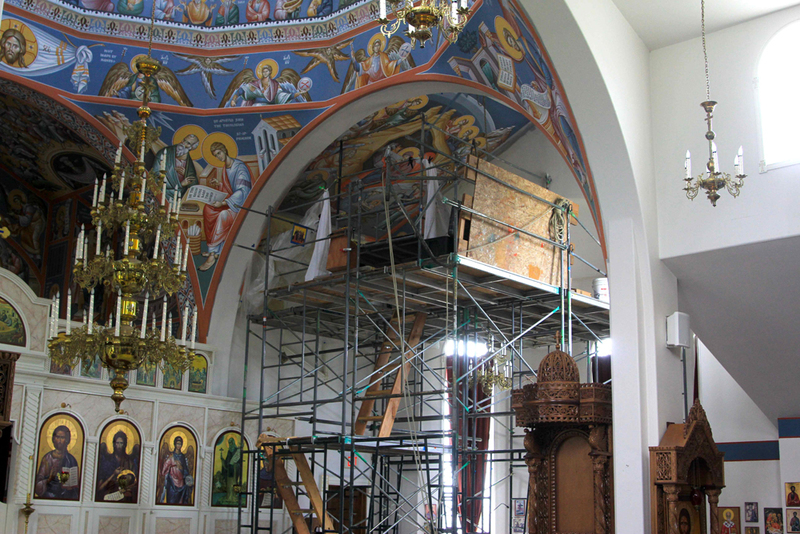 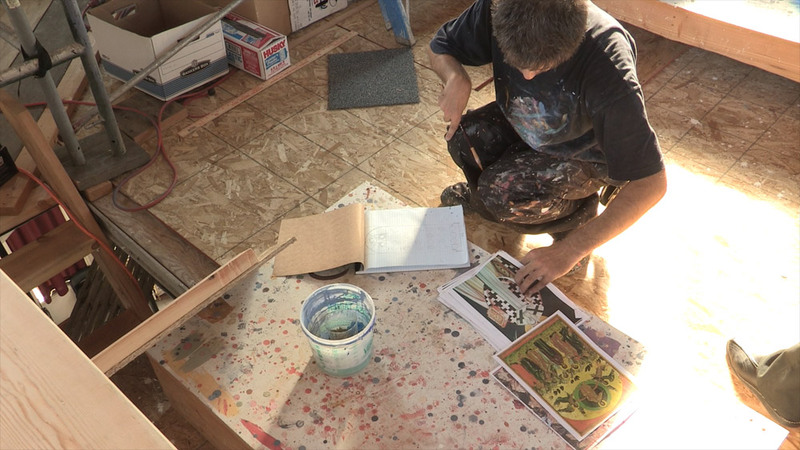 This project has been and will continue to be financially costly. 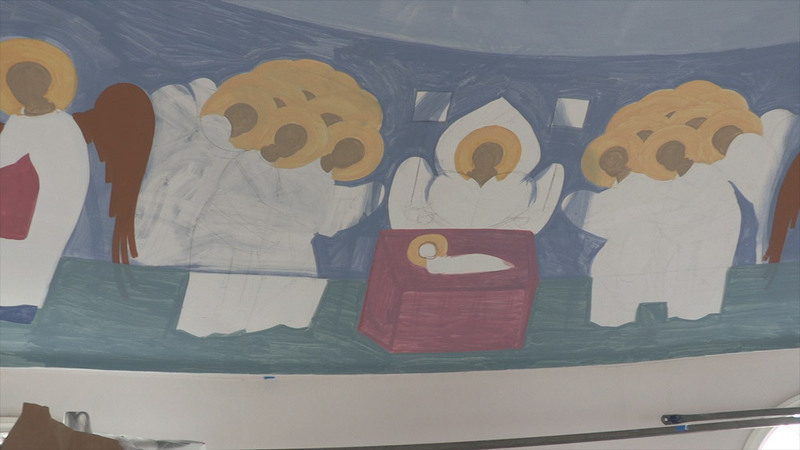 You may help with a monetary gift large or small. 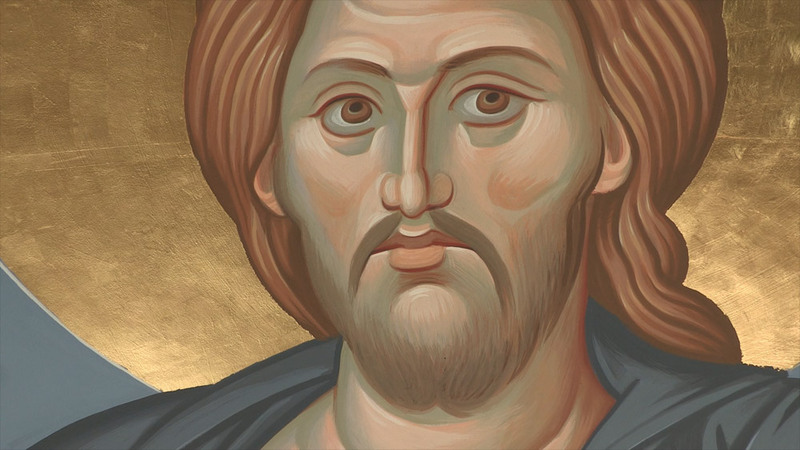 All will be welcome to help in this effort. 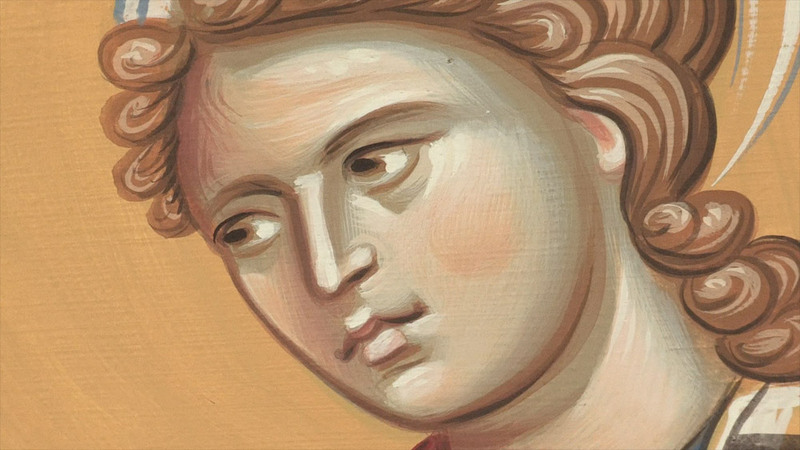 For your convenience we have provided a link to PayPal to expedite your gift. 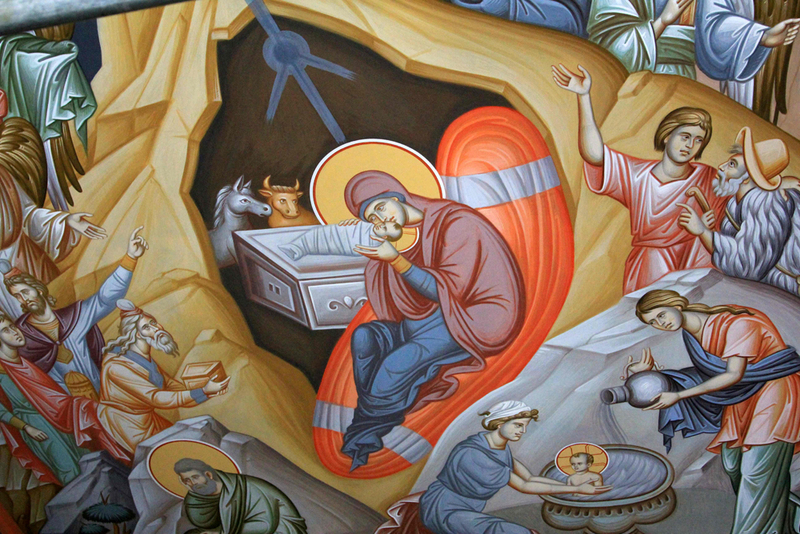 May God bless it!